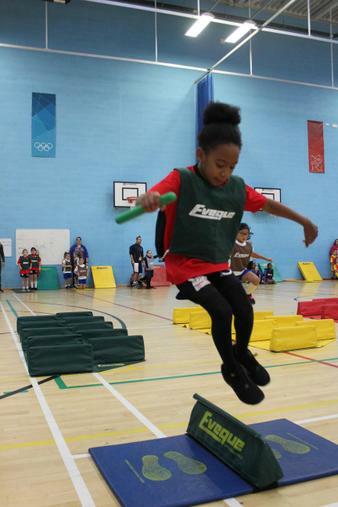 Spirit of the Games: School Games Values. 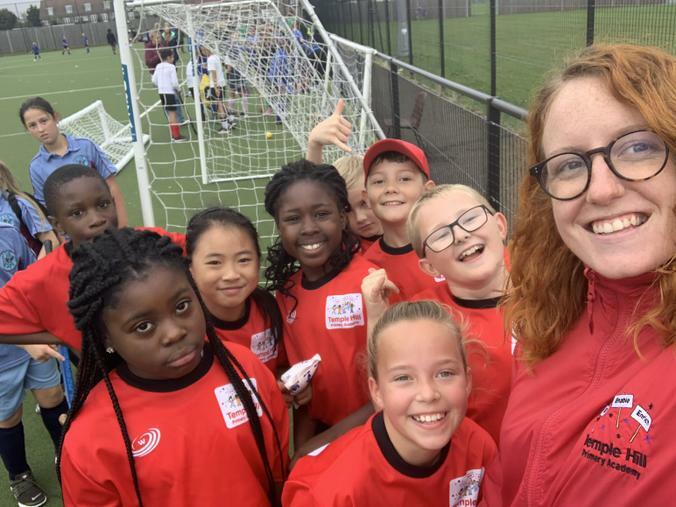 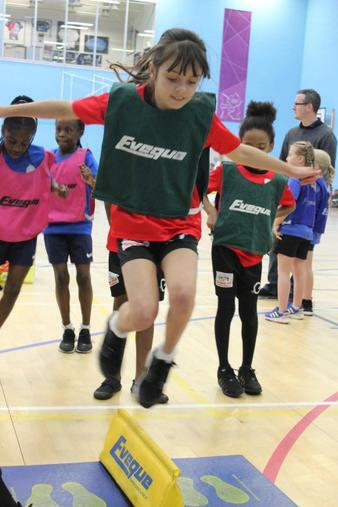 The six School Games values - Passion, Self-Belief, Respect, Honesty, Determination and Teamwork - were developed by young people to recognise how the experience of sport should be epitomised and embodied within schools, and to reflect the 'spirit' of the School Game. 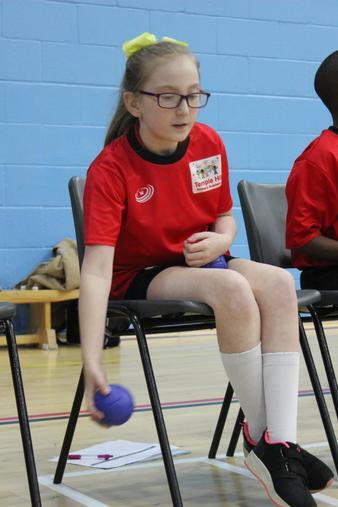 We attended our second Boccia Festival of the year this week. 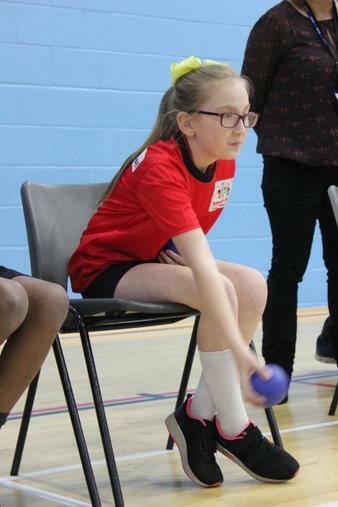 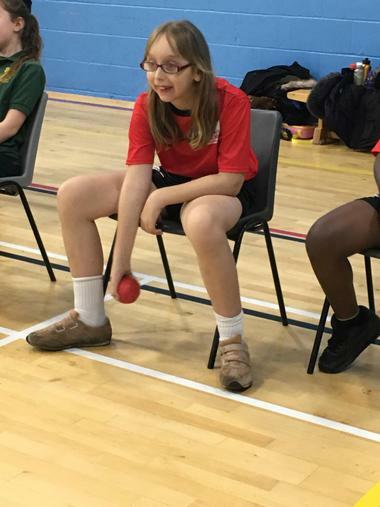 Boccia is a Paraoylmpic Sport similar to Boules and is played in a seated position therefore ideal for both disabled and non-disabled people to play together. 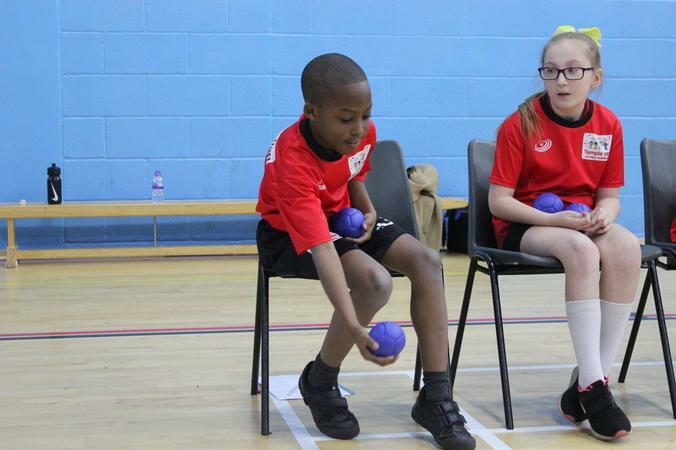 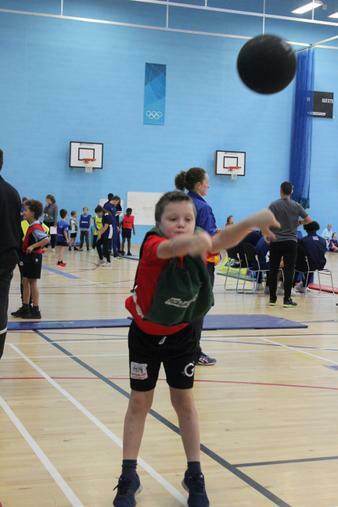 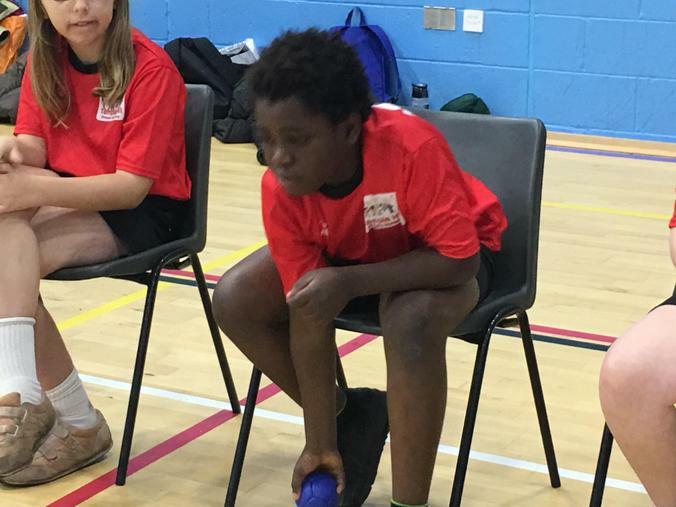 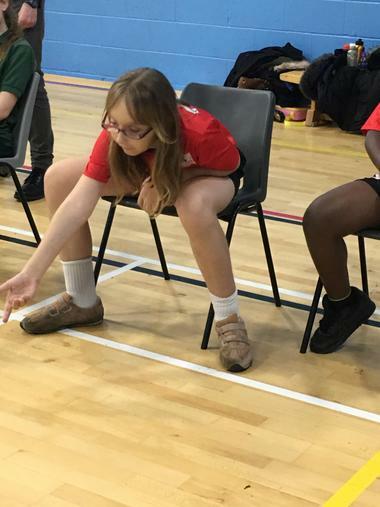 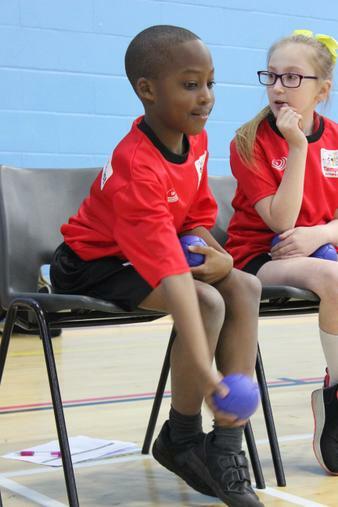 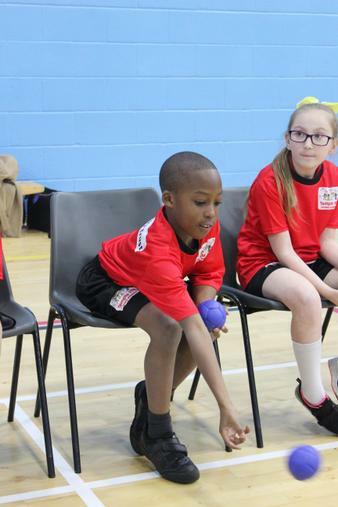 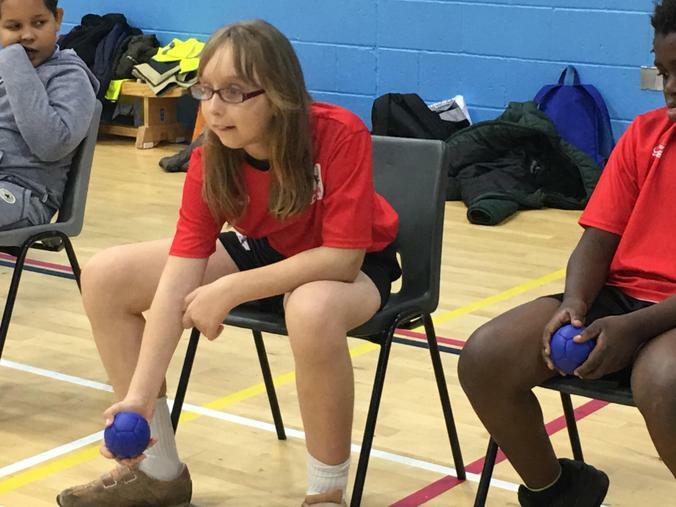 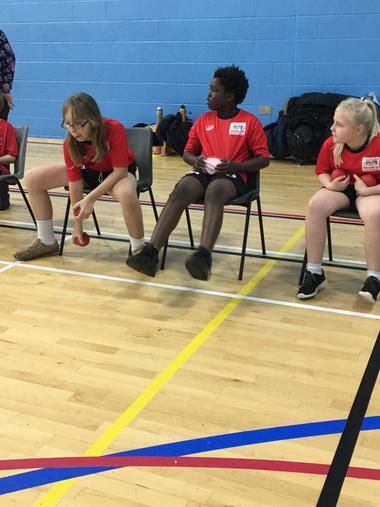 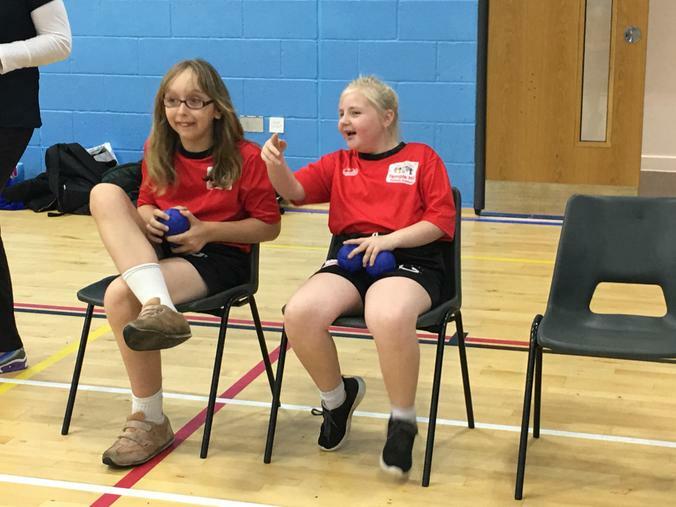 With nine schools taking part, this was the biggest Boccia festival to date. 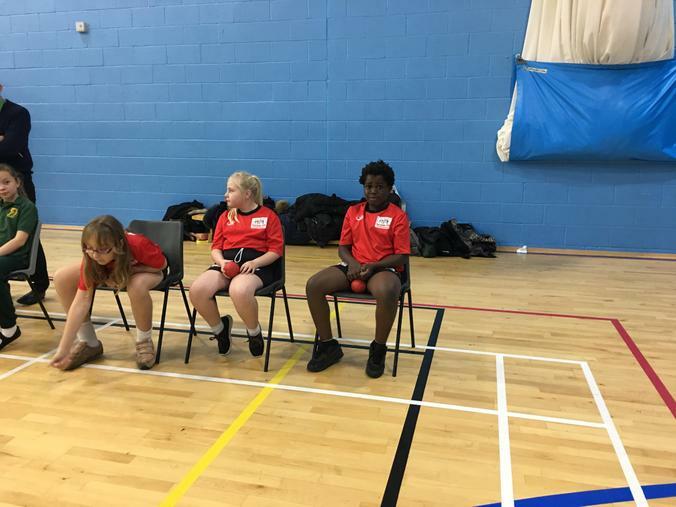 We played a total of 5 matches, winning three of them. 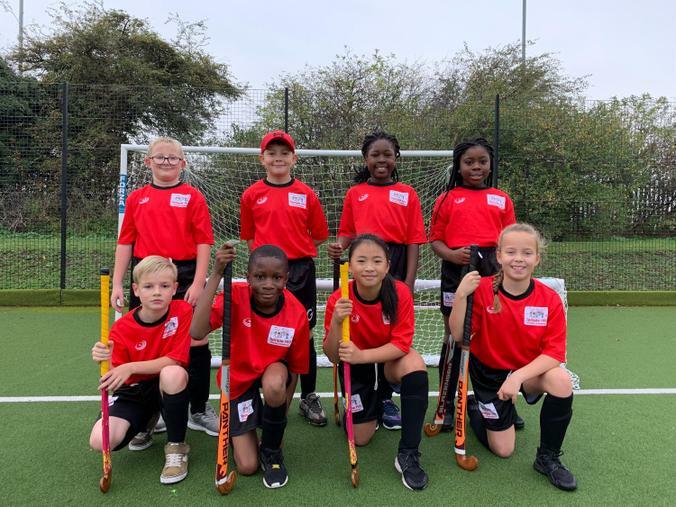 In true Temple Hill style we played really well and as always showed great sportsmanship. 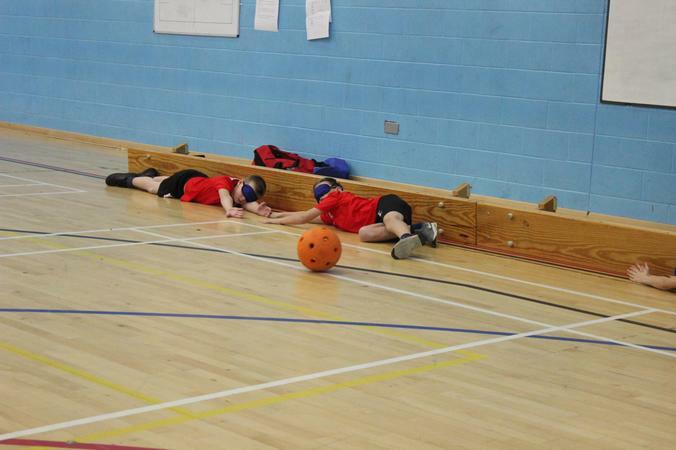 This was the first time our team of three had played, doing fantastically well to come away in joint 4th place. 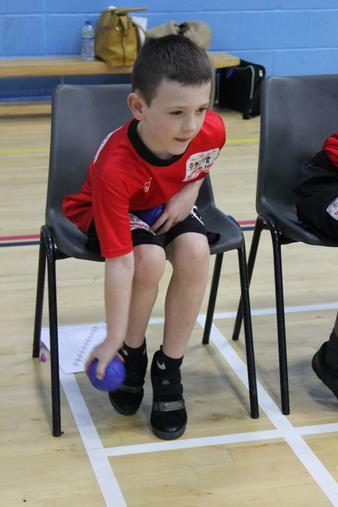 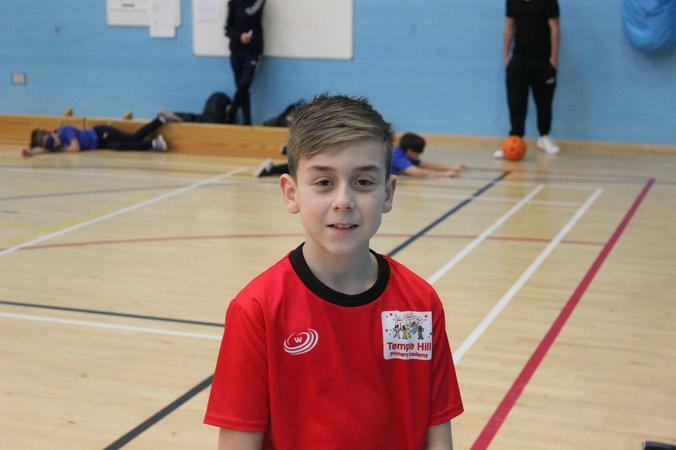 A special mention to Ollie, currently in Year 2 for playing in a tournament which is usually for children in Years 4-6. 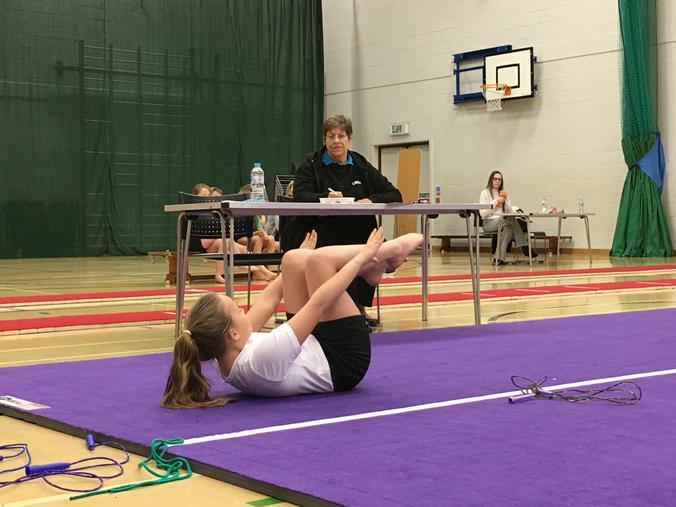 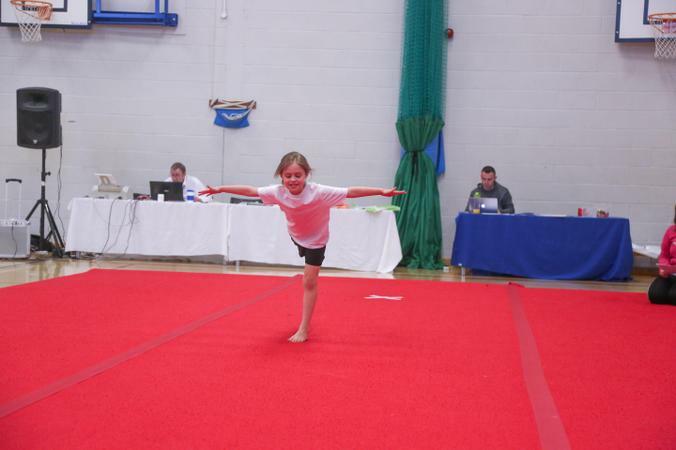 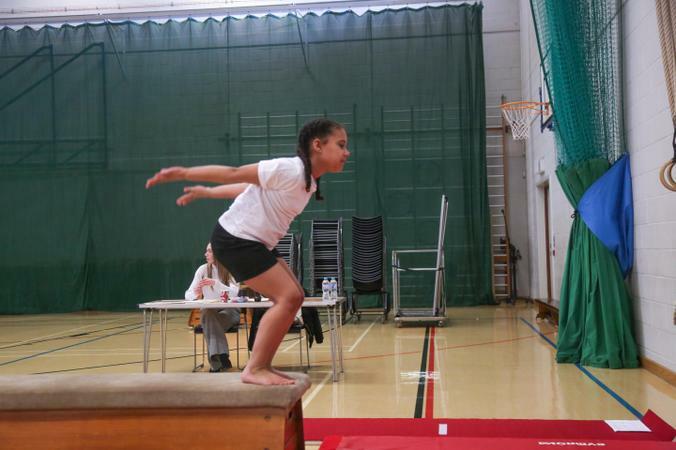 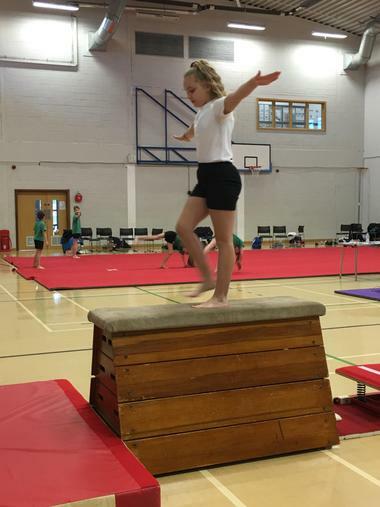 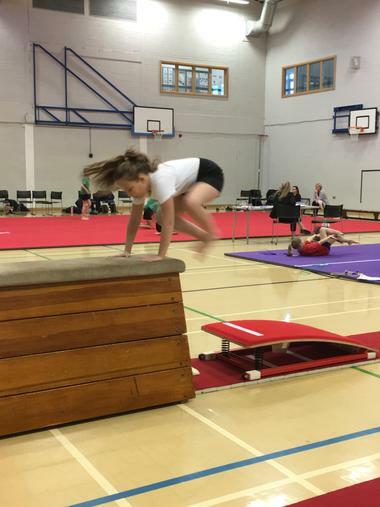 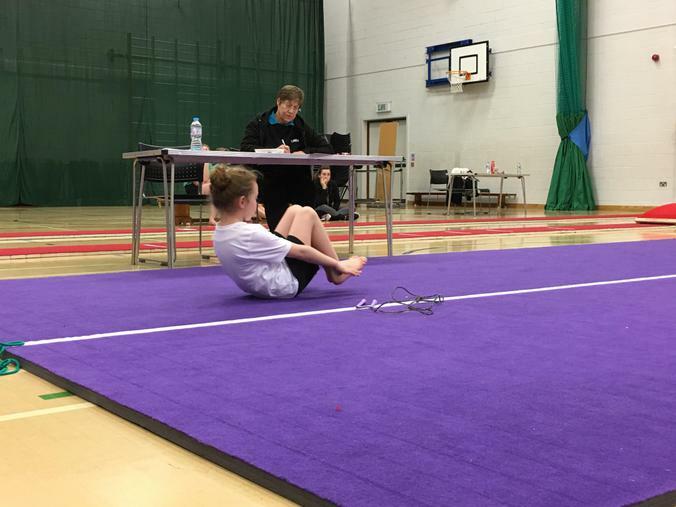 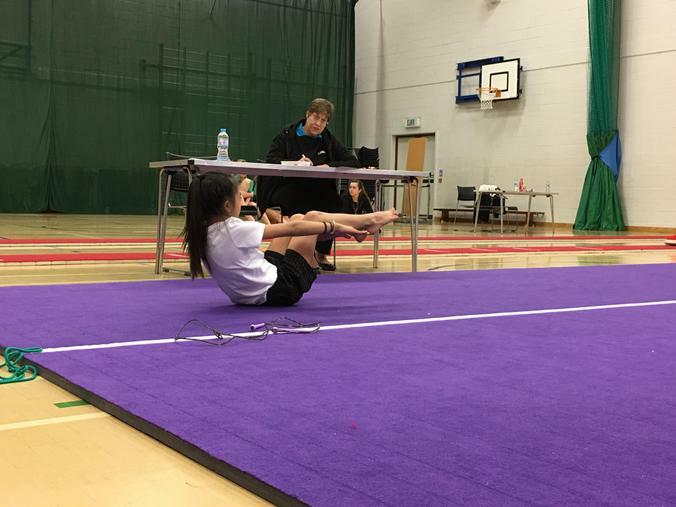 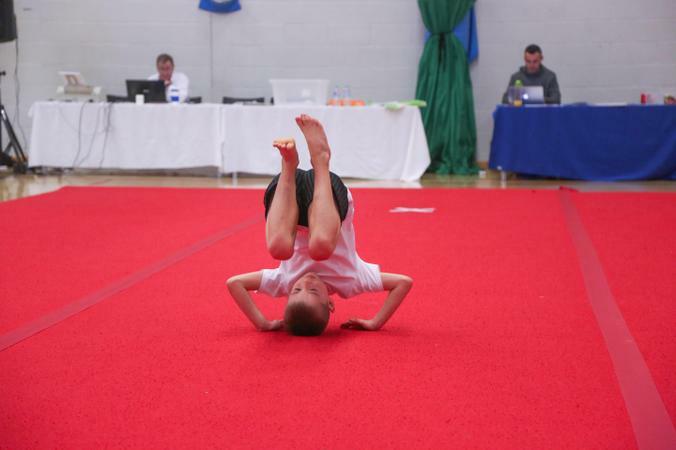 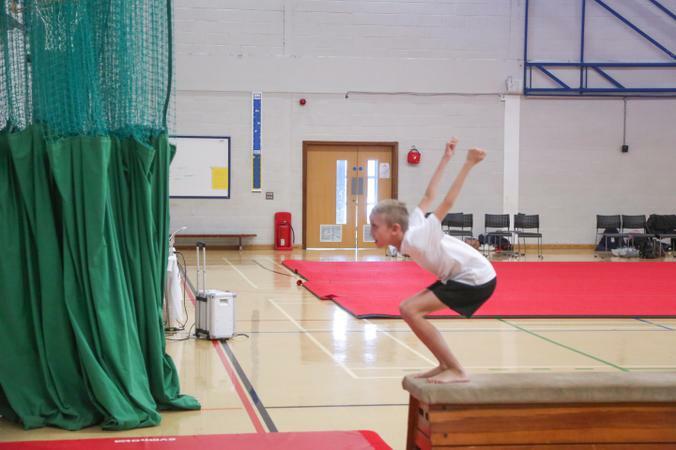 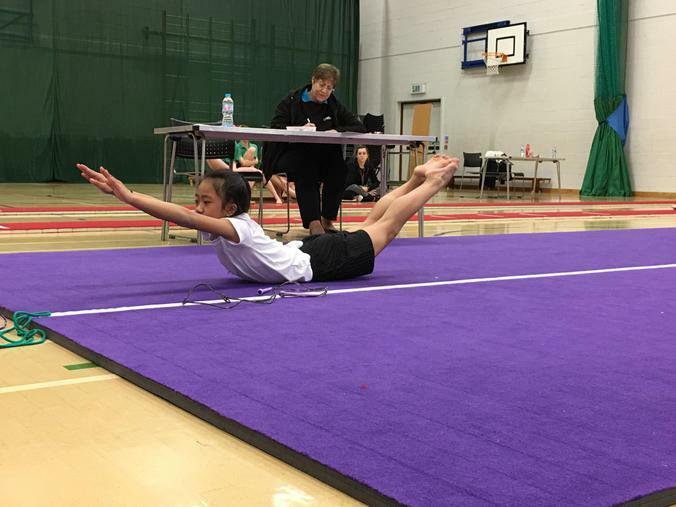 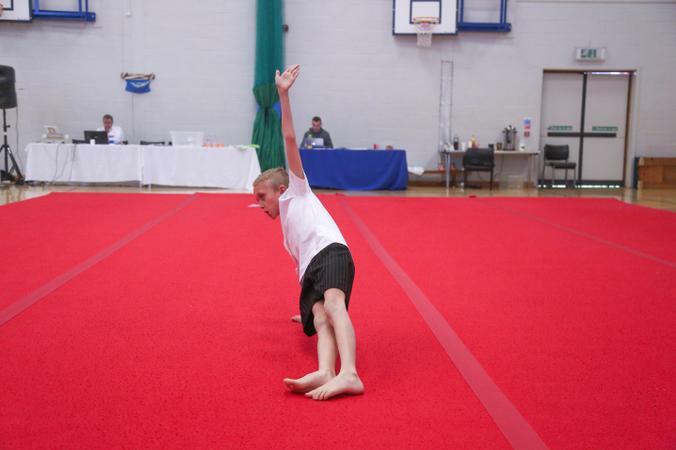 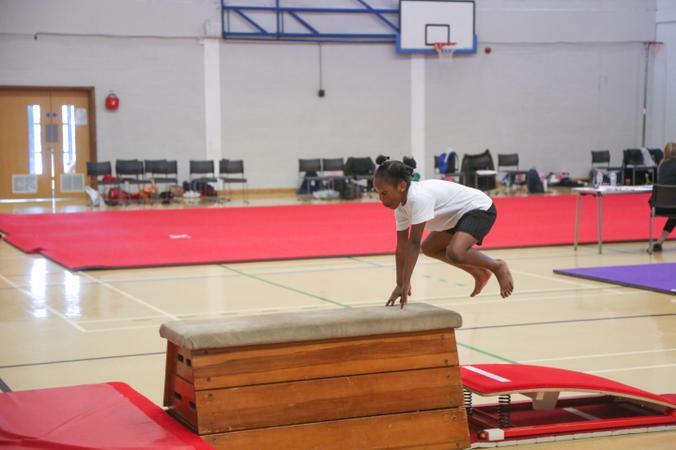 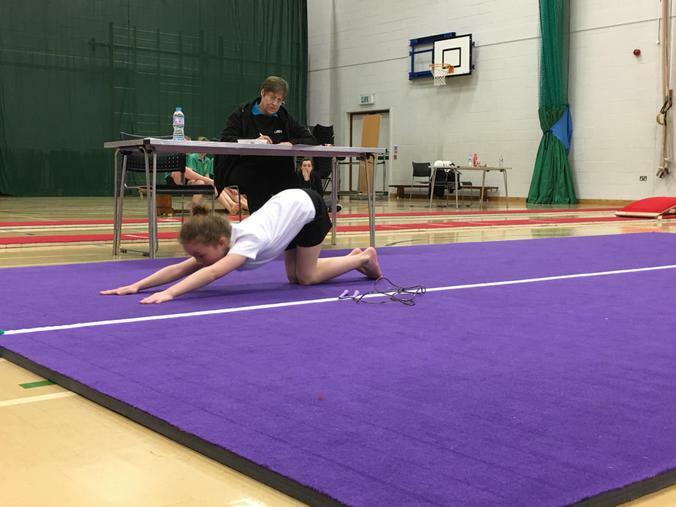 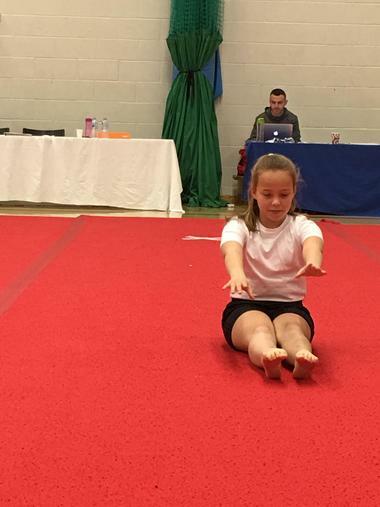 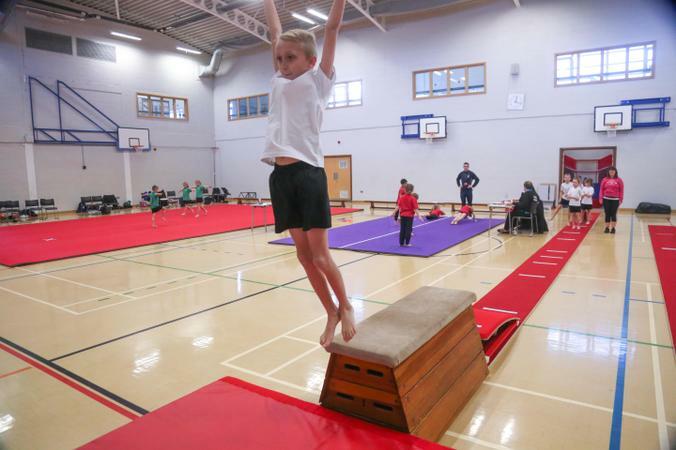 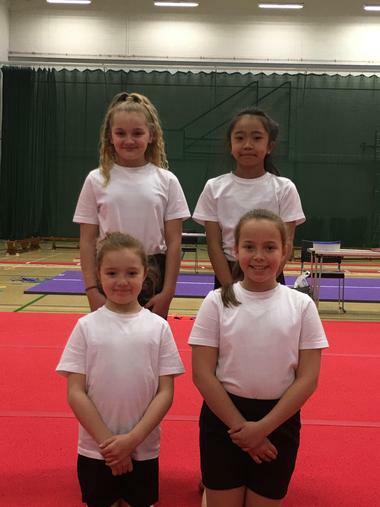 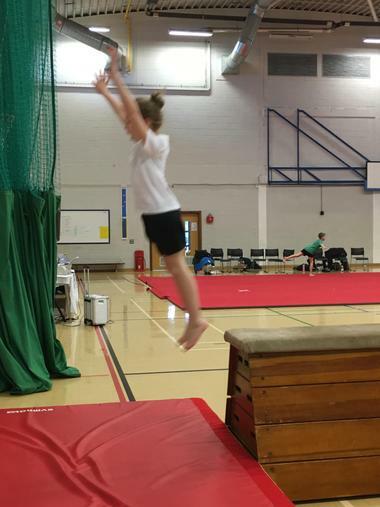 On Wednesday 13th March, three squads of gymnasts travelled to Dartford Science & Technology College to take part in the Dartford School Games, Key Steps Gymnastic Competition. 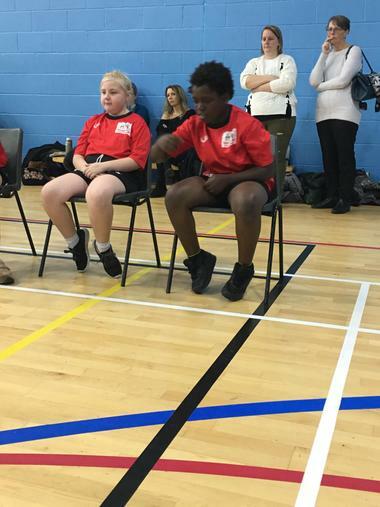 For some children this was the first time they had represented the school at an event, so understandably were a little nervous. 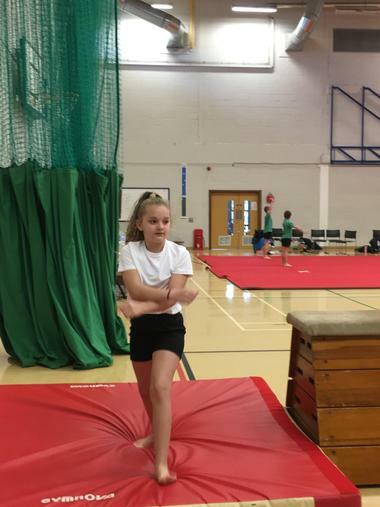 Everyone has been working extremely hard under the guidance of our team coach, Sam Clemmence to learn their routines, they all had three to learn. 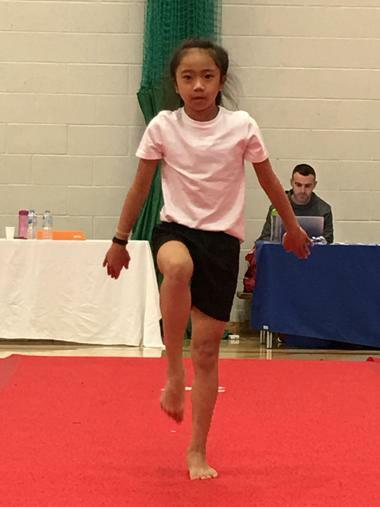 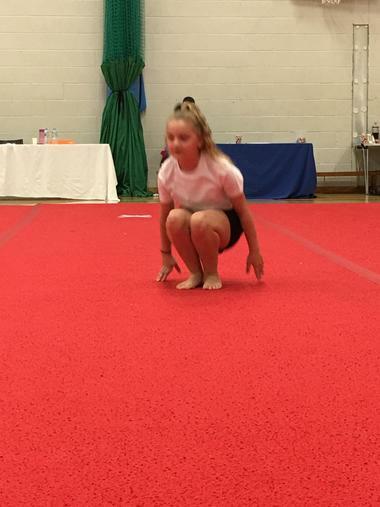 Everyone worked hard during the competition, especially our mini coach Madison, who not only coached the teams if they forgot what came next, she actually stepped up and joined the Year 6 squad when they were a member missing due to illness. 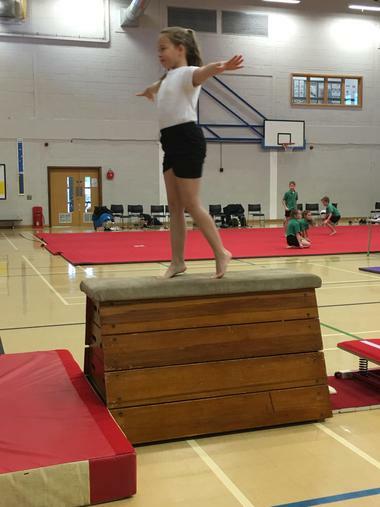 This was a huge achievement for Madison as she is currently only in Year 3! 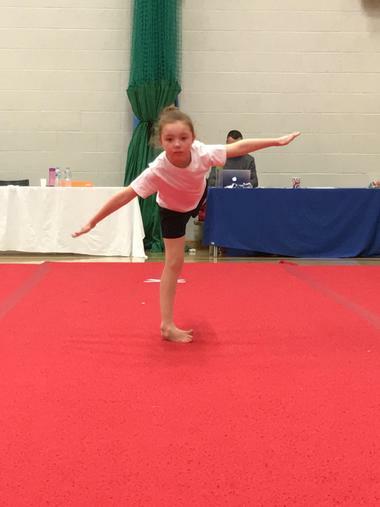 Congratulations to Rebecca who scored 9.2 for her floor routine, Theo scored 9.6 for his vault and Kacey-Ann scored 9.4 for her vault, these were the highest scores out of everyone who took part. 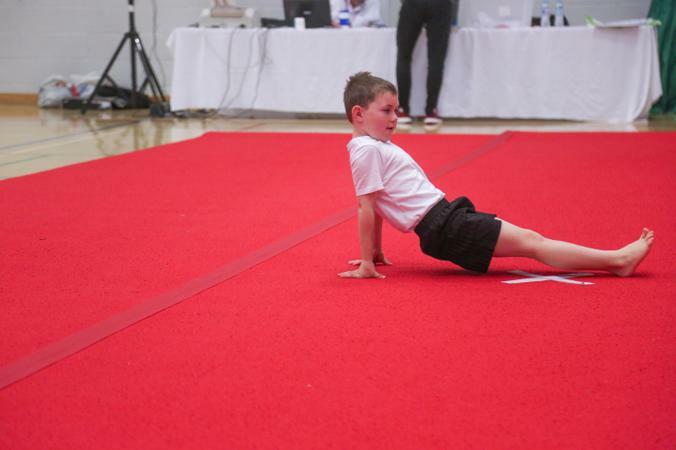 A HUGE thank you also to Amanda Miles, Julie Rye and Nicola Wiltshire for transporting the squads to and from the event and to Darren Stephens for his wonderful photography as always. 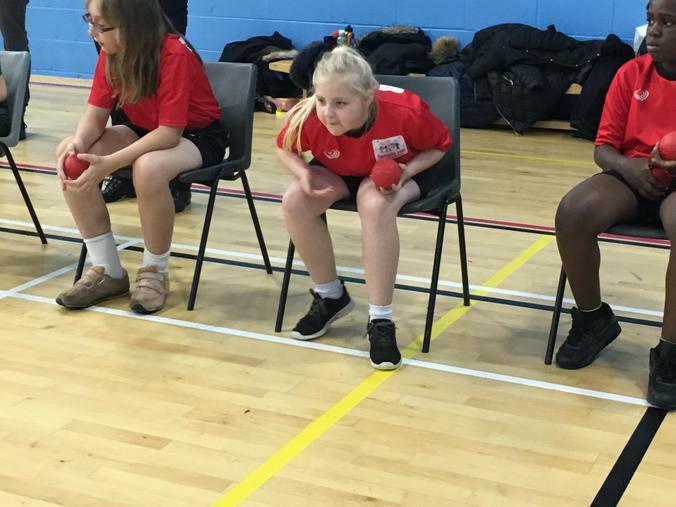 On Tuesday 5th March our handball team travelled to North Kent College for the Dartford School Games Handball Tournament. 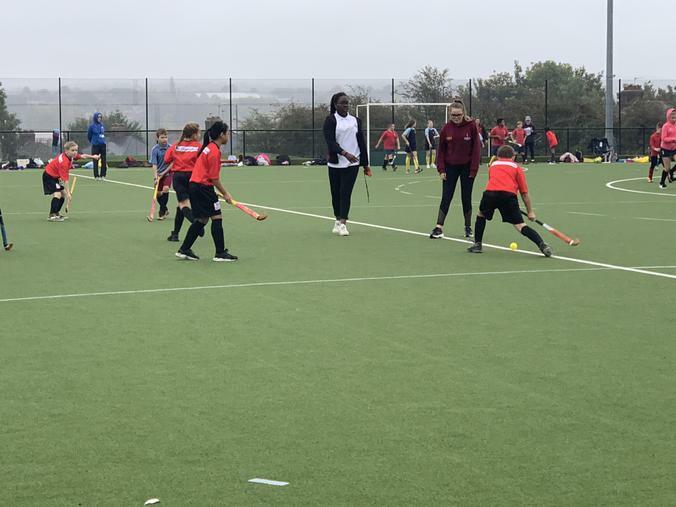 Demonstrating some great pass and move sequences, the team got off to a flying start winning their first game 8-1 against Joydens Wood. 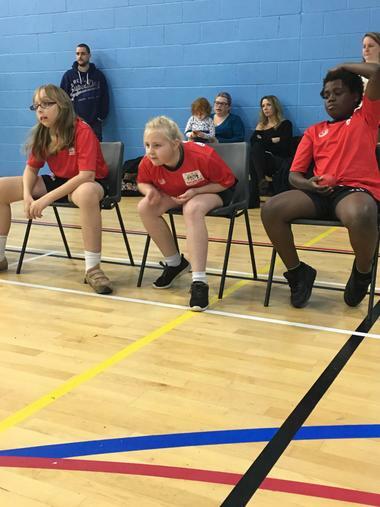 We went on to play a further 5 matches with a mix of results. 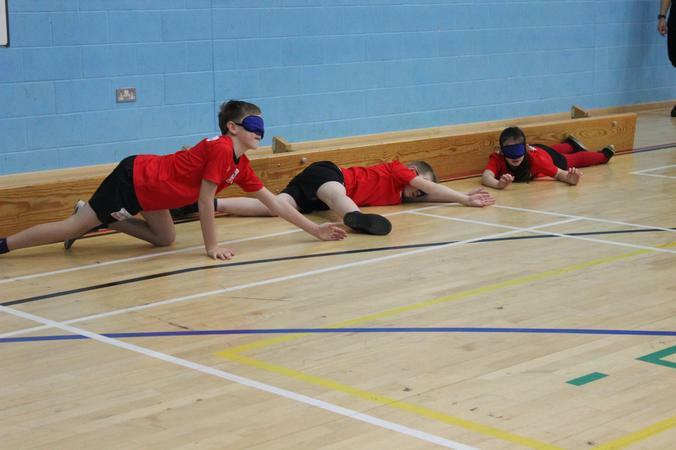 The team worked really hard and demonstrated great teamwork. 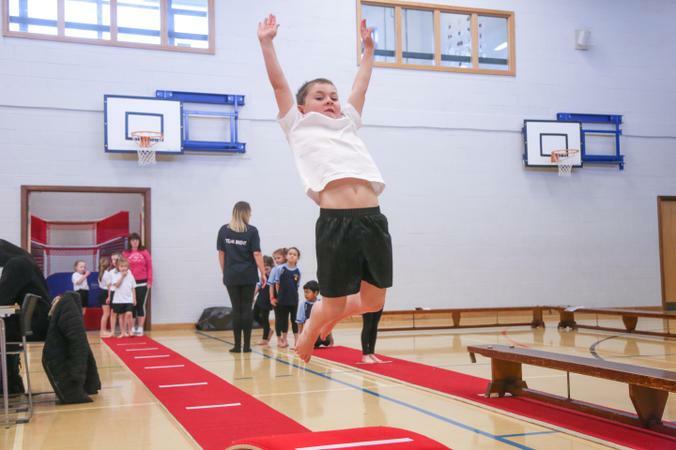 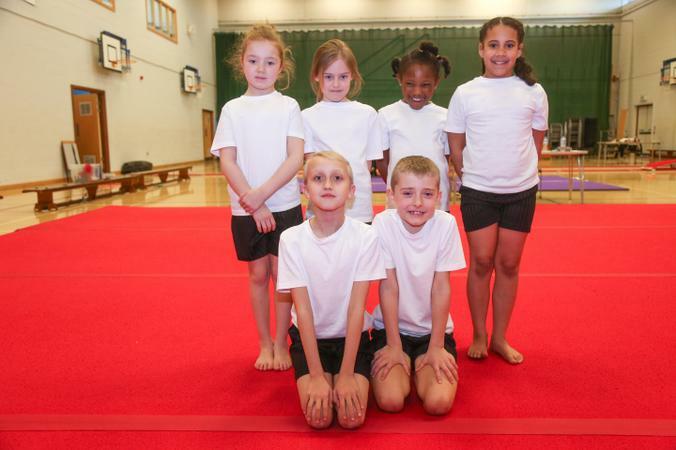 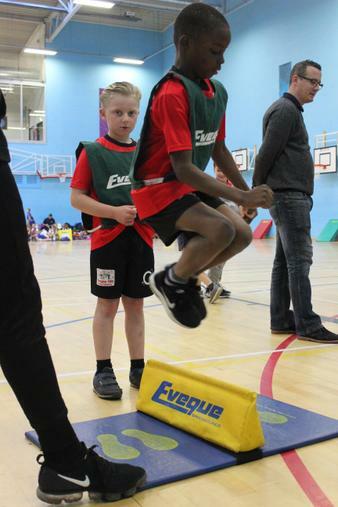 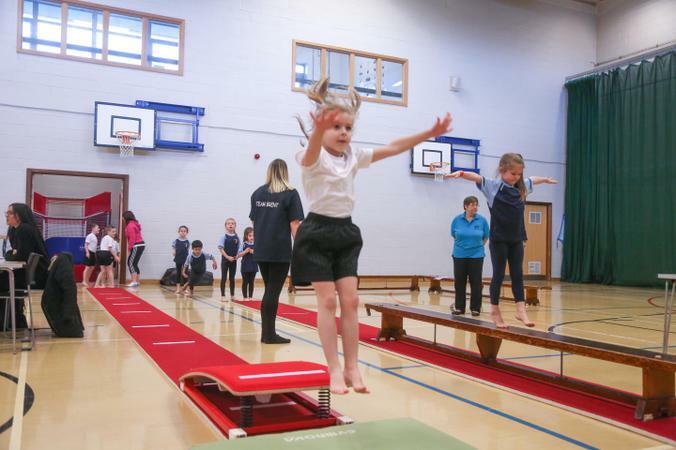 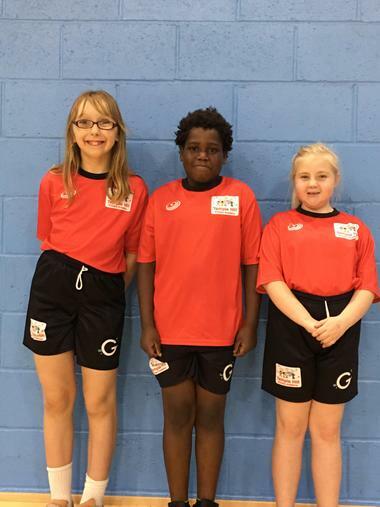 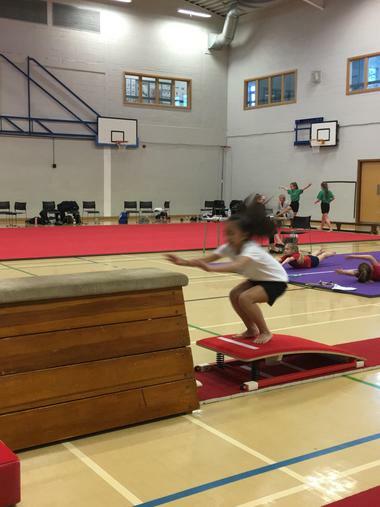 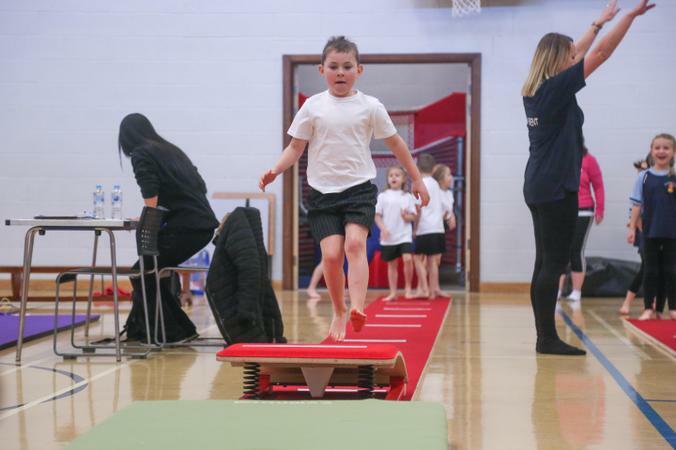 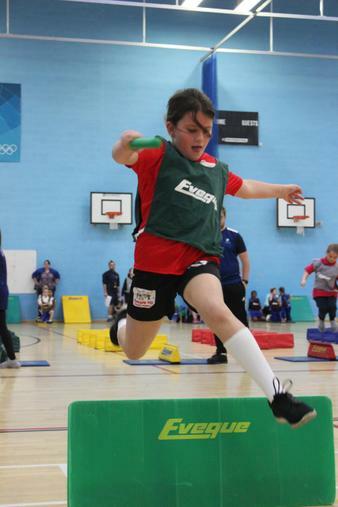 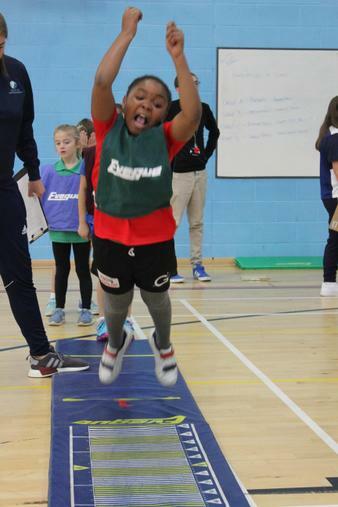 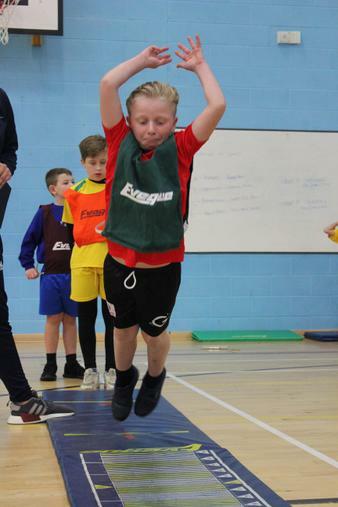 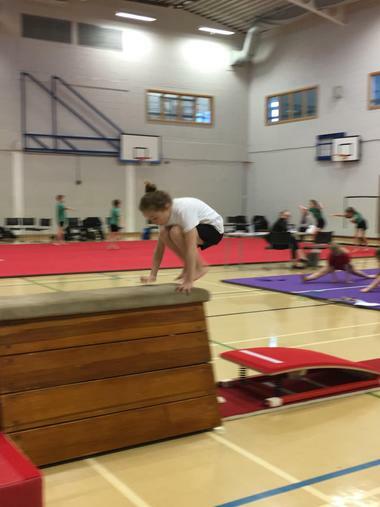 Nine extremely excited Year 2’s travelled to Ebbsfleet Academy on Tuesday 12th February for the School Games Infant Agility tournament. 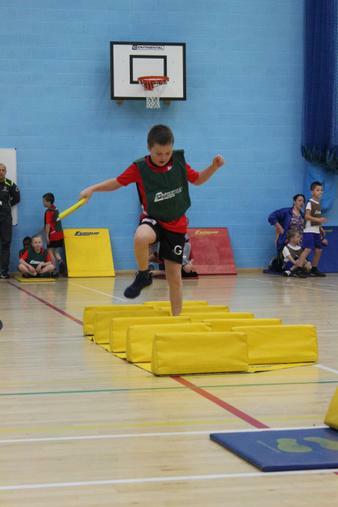 Taking part in eight different activities the children showed off their agility, throwing, jumping and kicking skills. 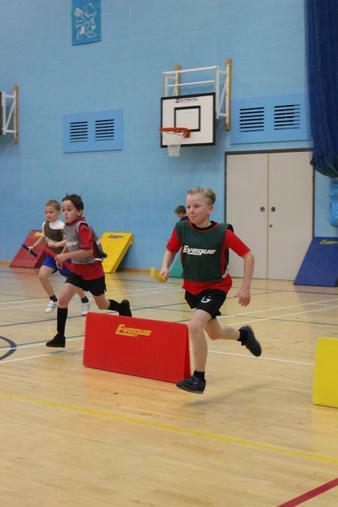 At each station they had the opportunity to score points, these were then added together to produce an overall score. 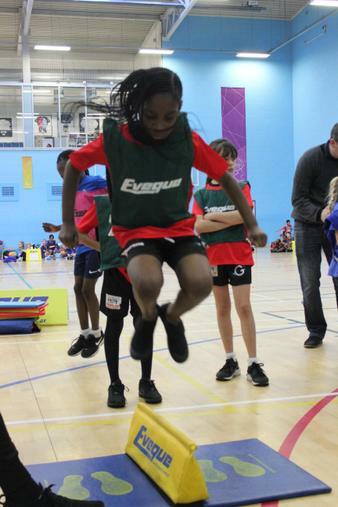 Ten schools took part and we came joint 4th with The Brent (no 3rd place), Craylands came 2nd and Holy Trinity came 1st. 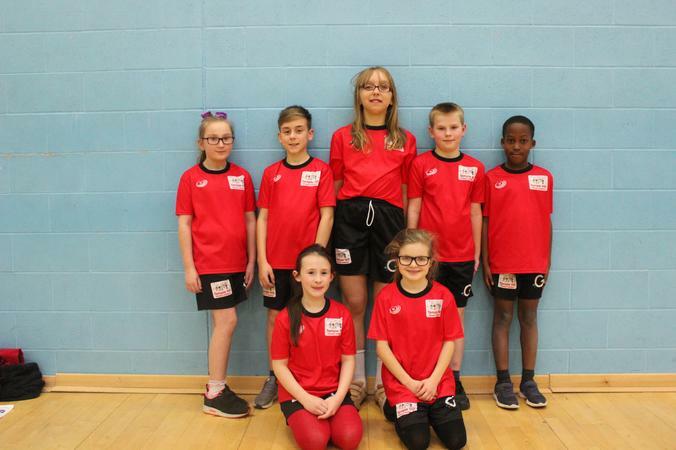 Not having represented the school before all nine children were amazing! 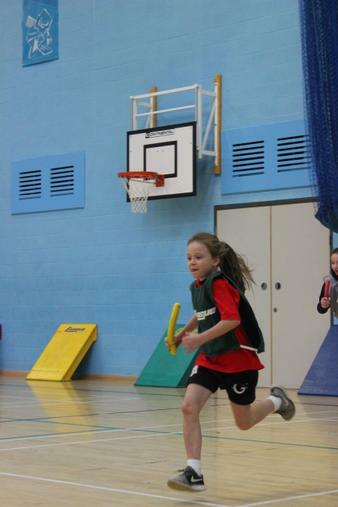 They showed great sportsmanship, behaved impeccably and above all thoroughly enjoyed themselves. 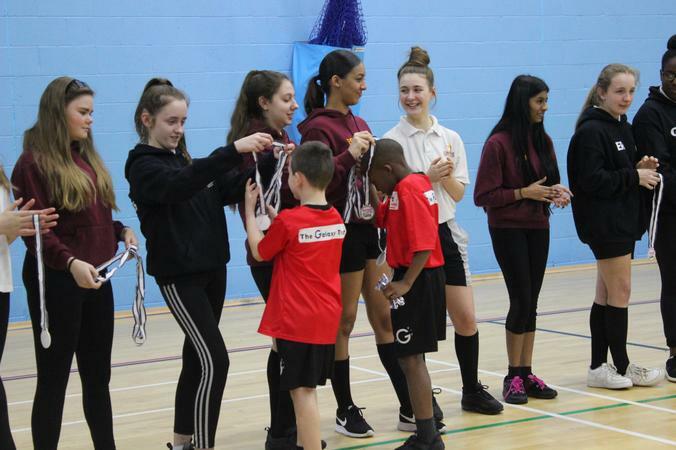 A MASSIVE well done to; Ollie, Telisha, Oliver, Feyikemi, Harrison, Rebecca, Ellis, Sofia and Markus. 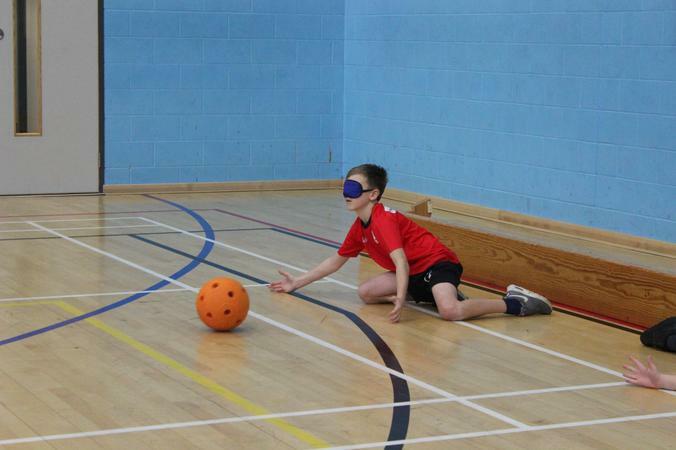 Goalball is a team sport developed for blind or visually impaired players, in which a ball containing bells which make a sound when in motion is thrown at a goal at the opposing team's end of the court. 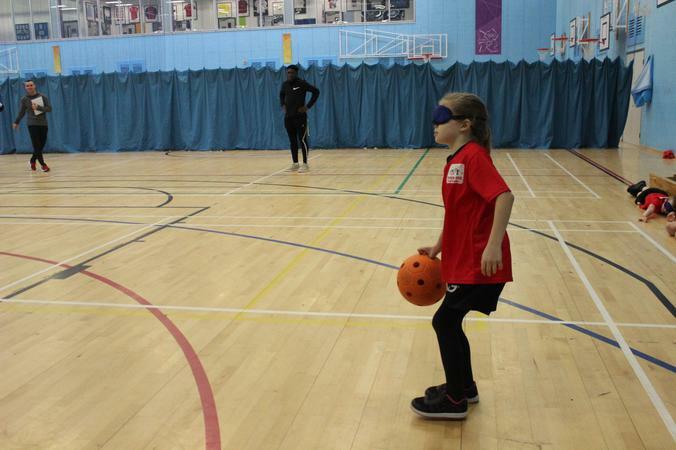 In order to make it inclusive, all team members wear a blindfold. 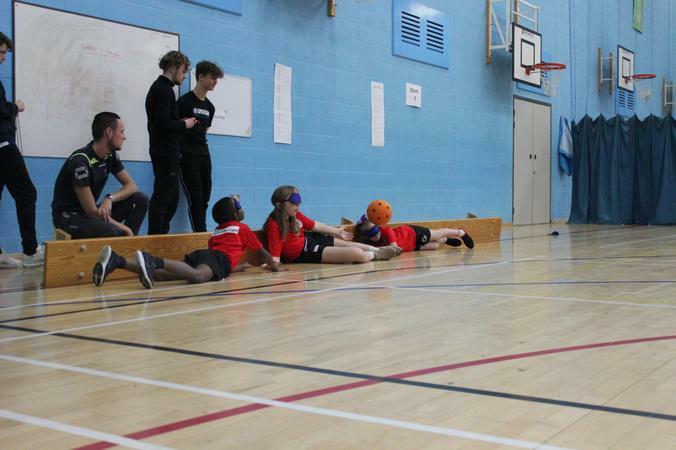 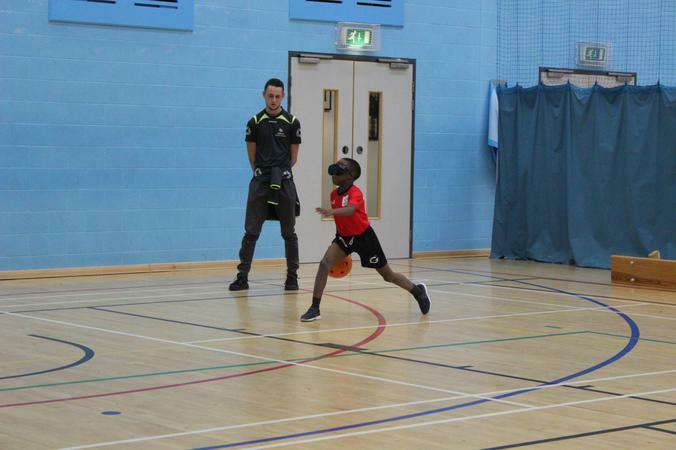 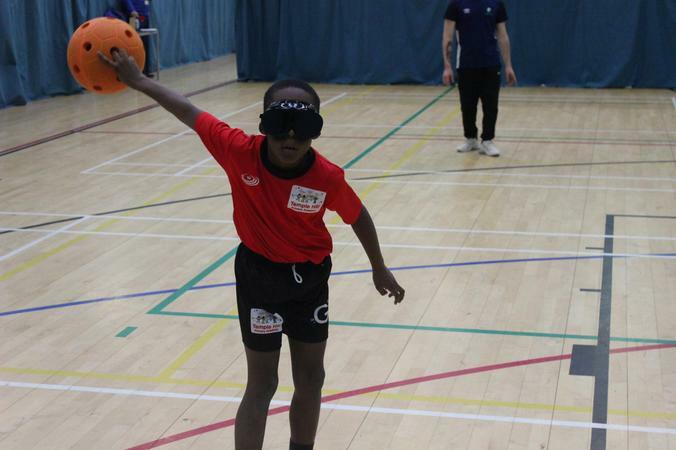 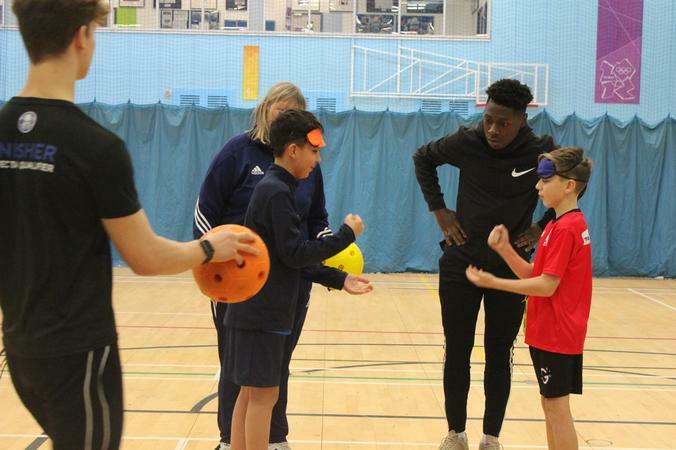 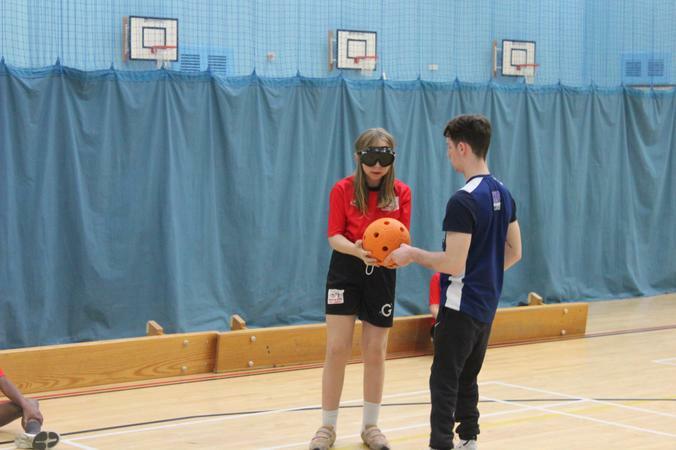 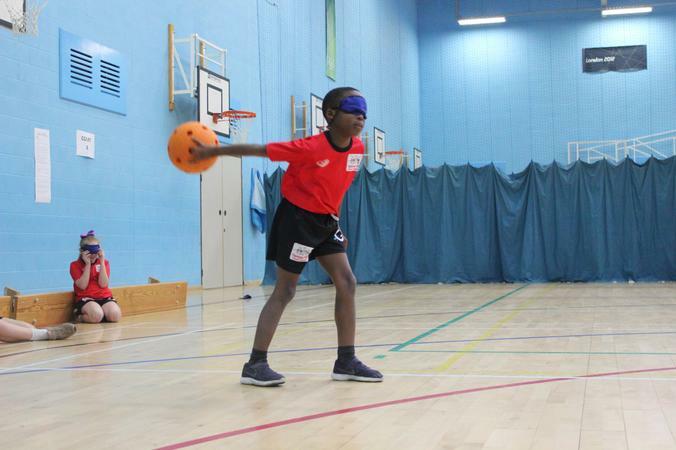 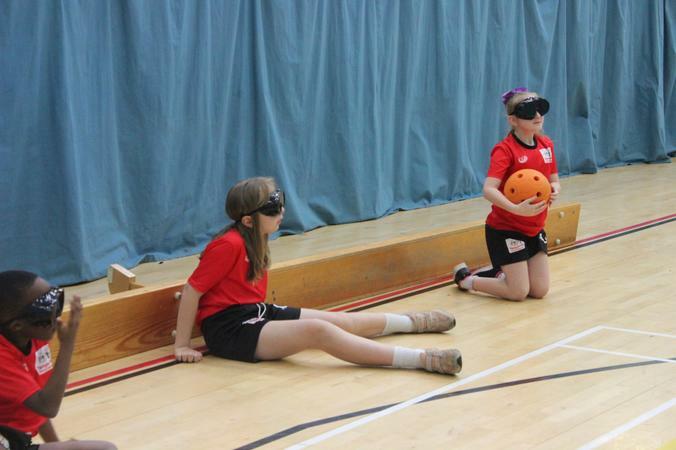 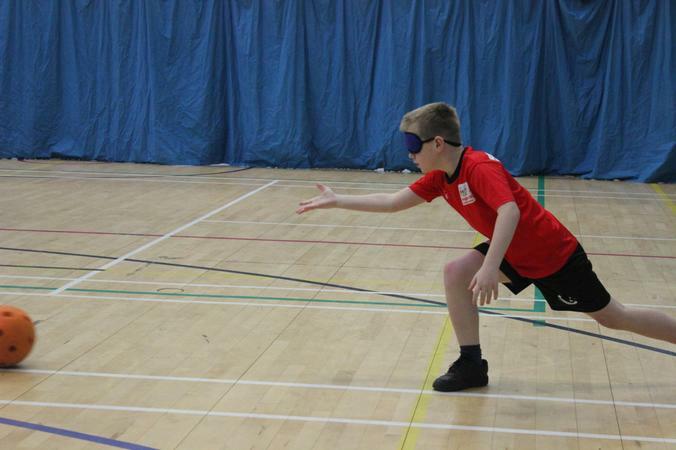 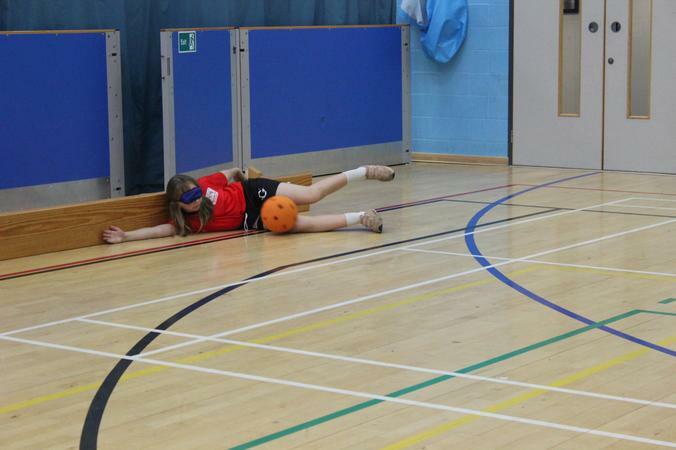 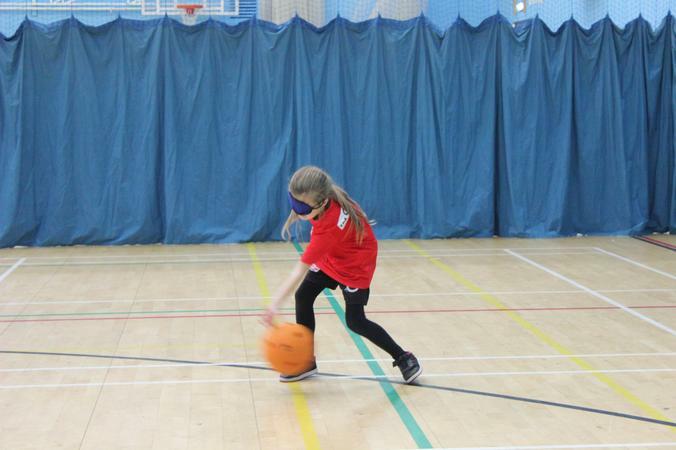 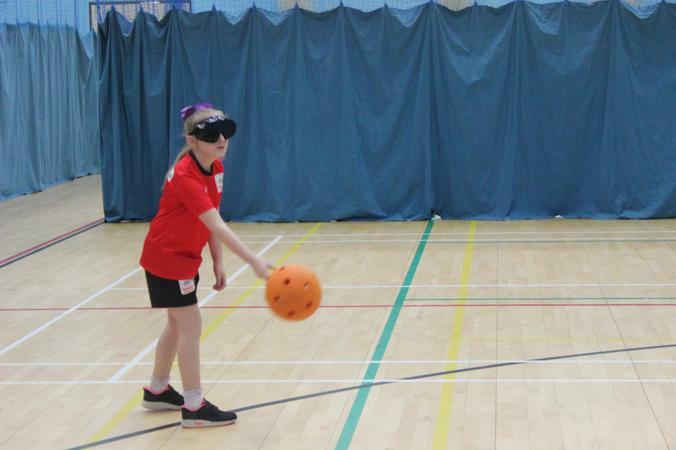 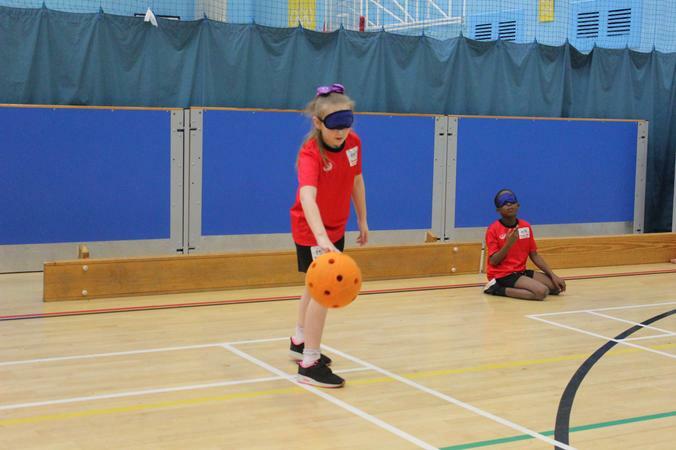 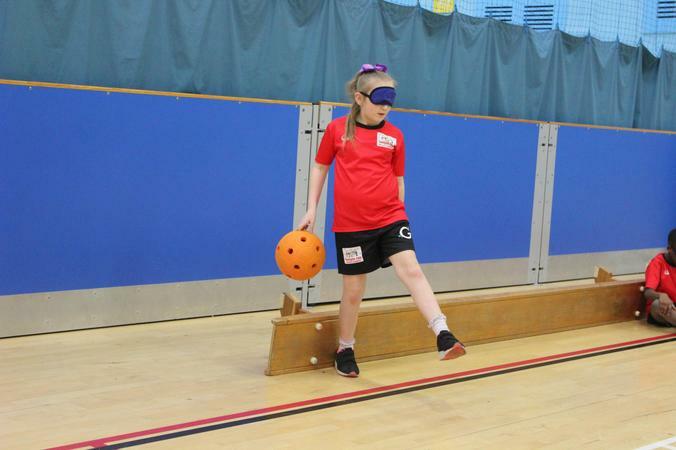 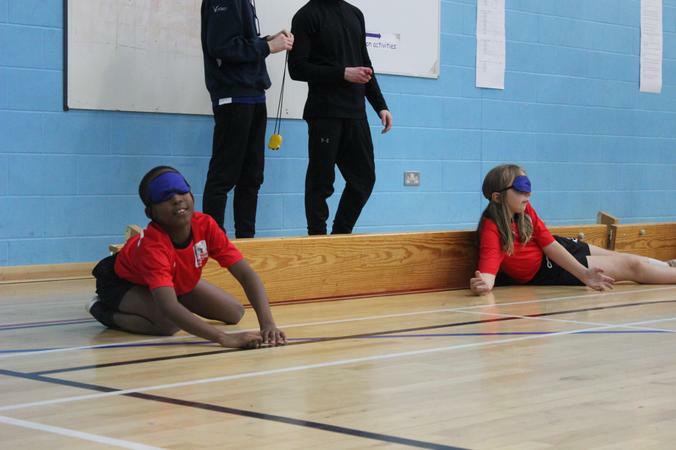 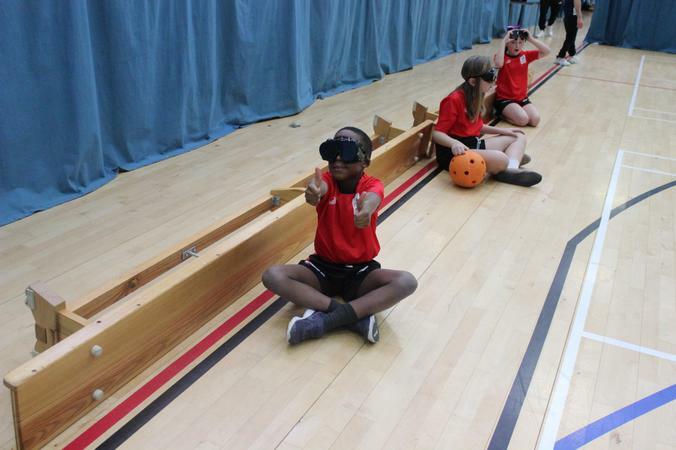 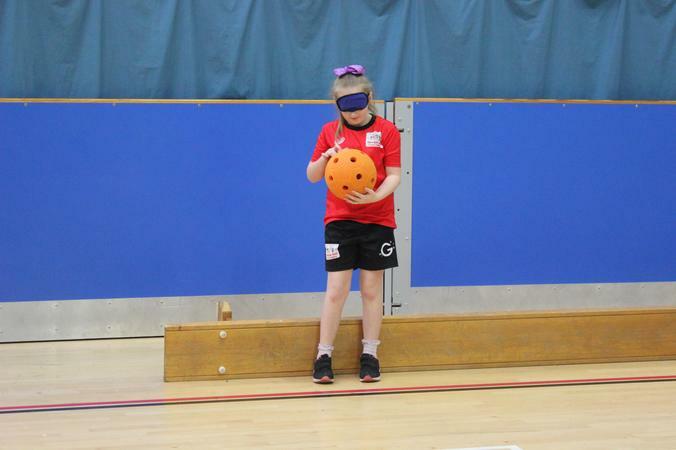 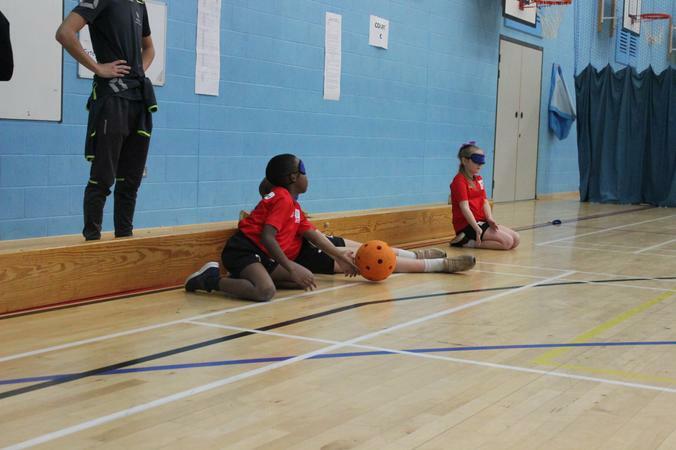 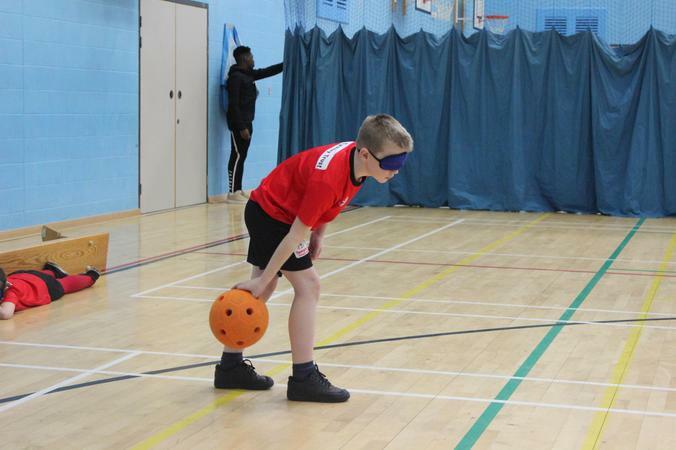 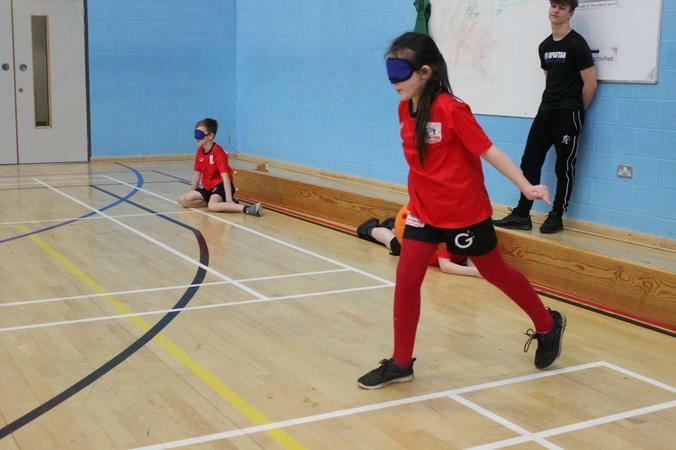 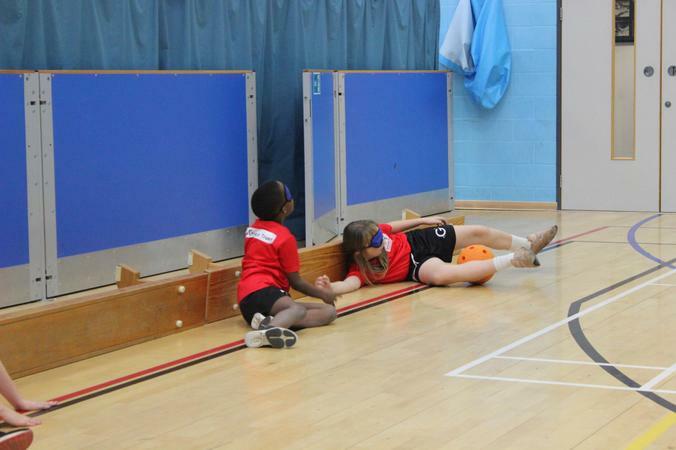 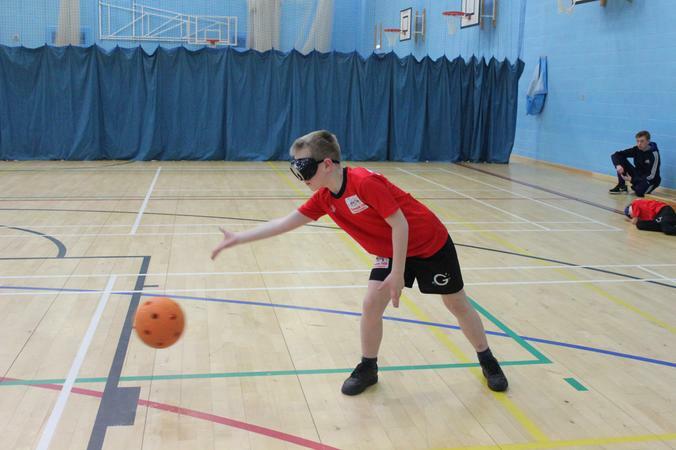 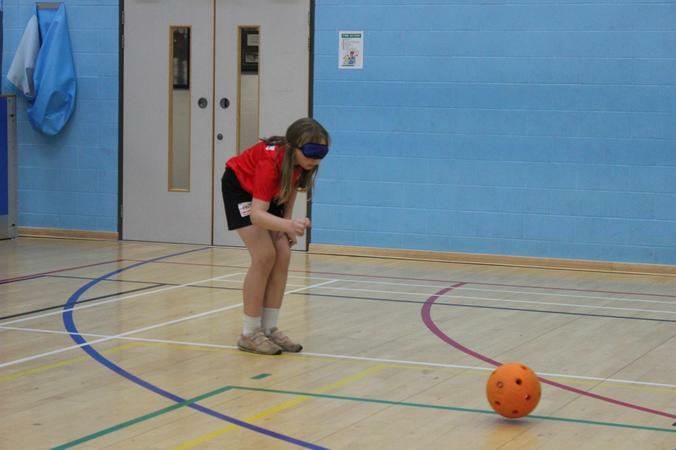 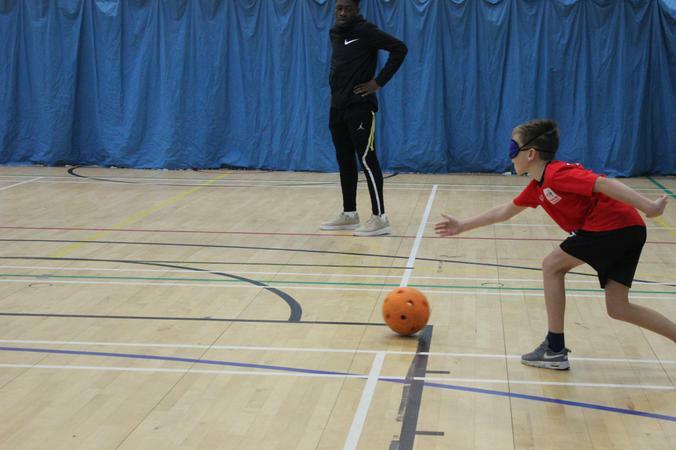 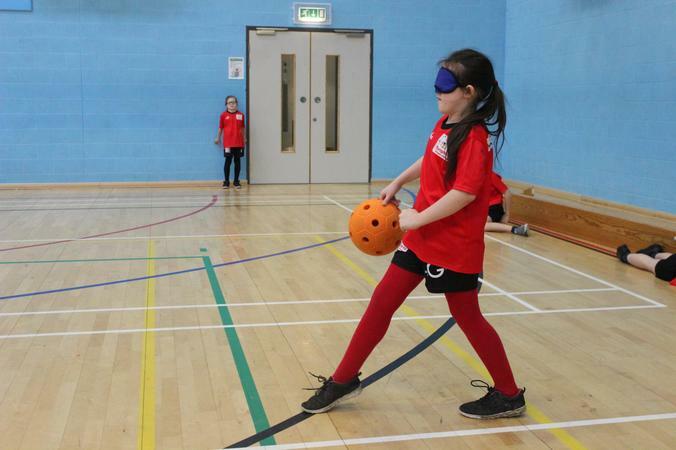 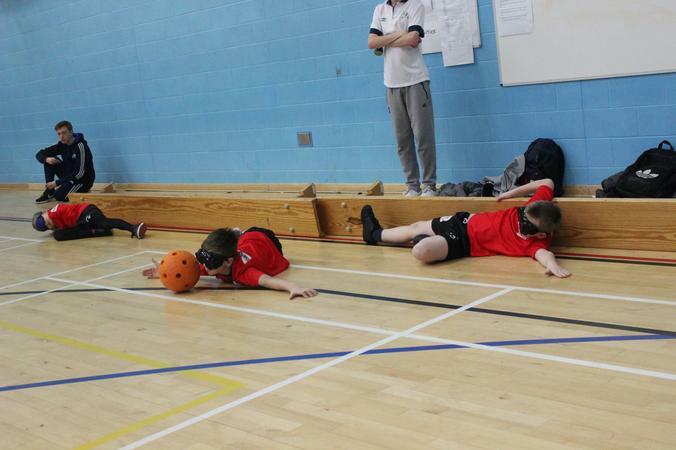 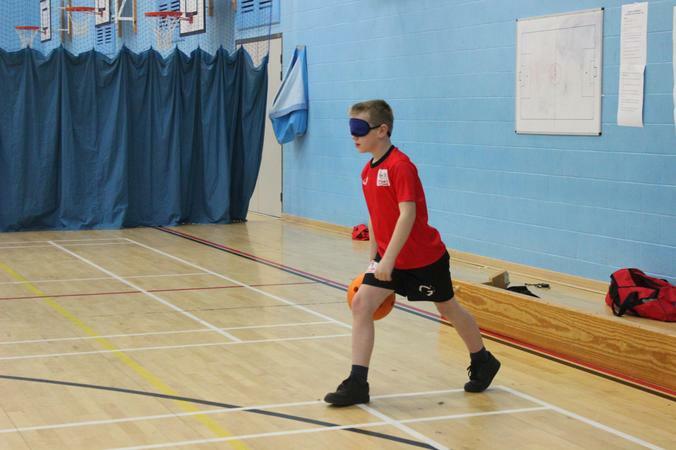 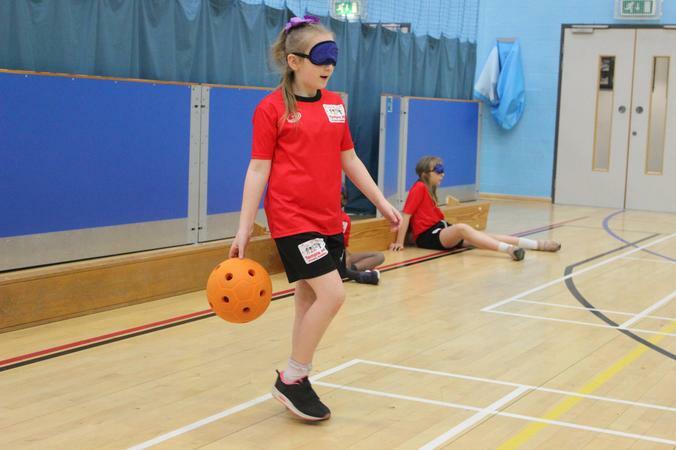 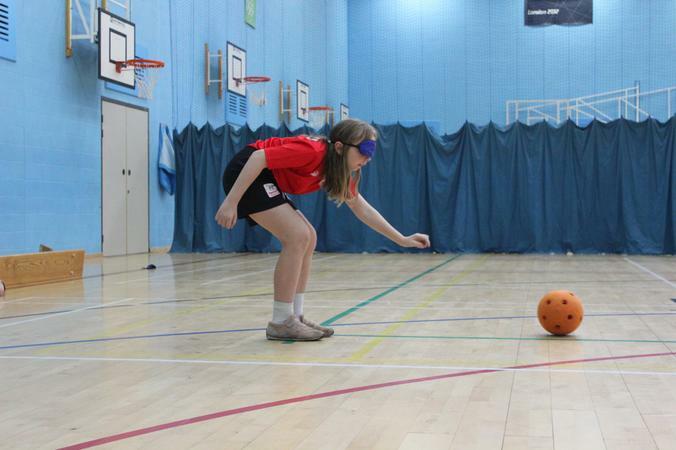 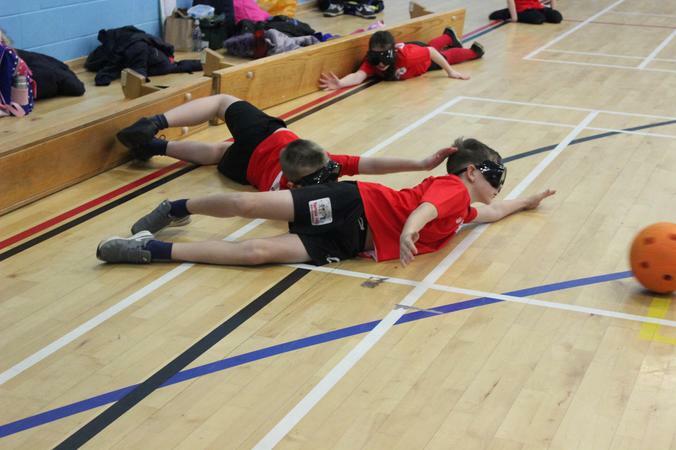 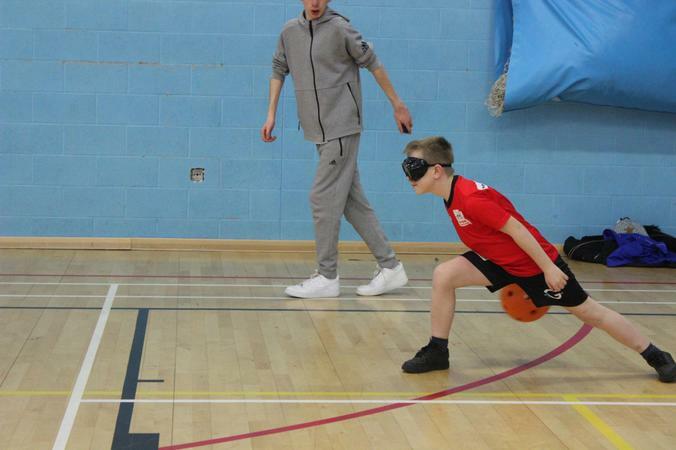 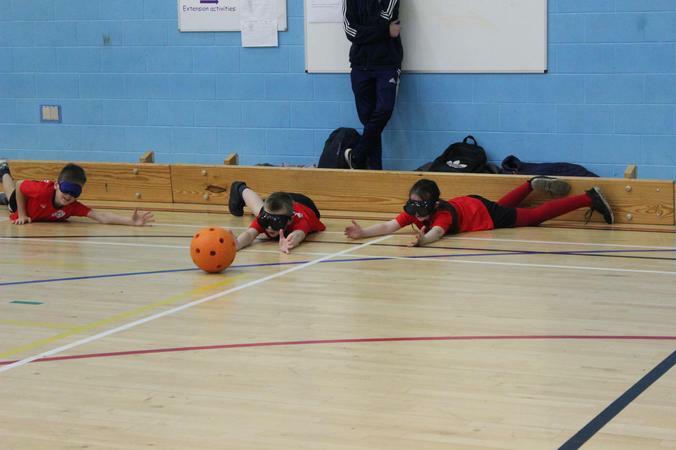 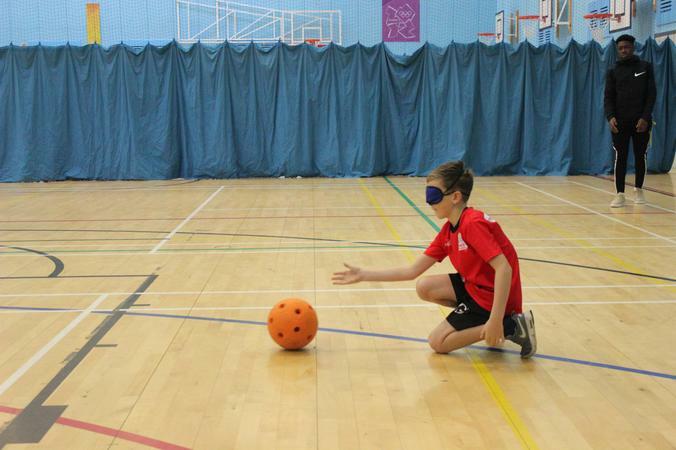 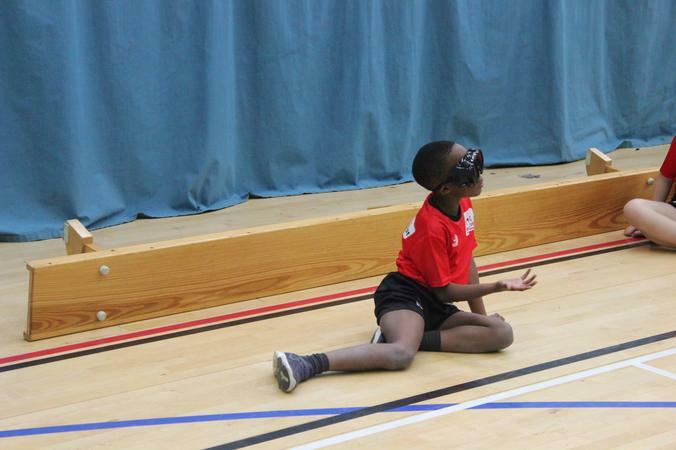 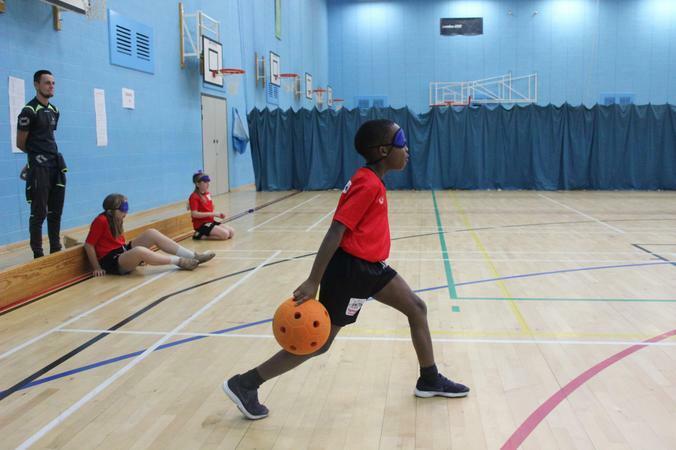 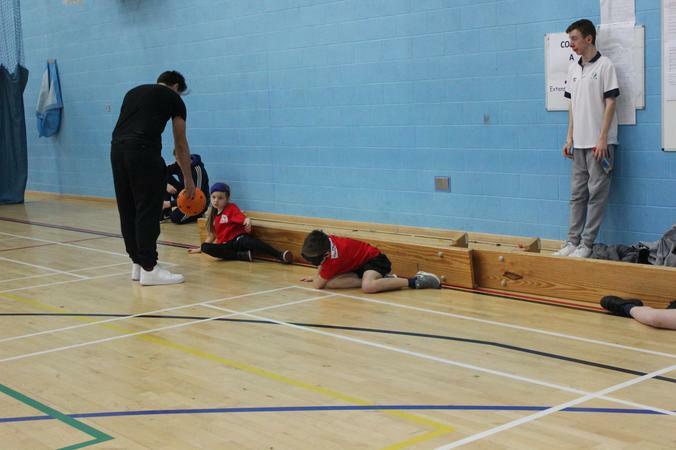 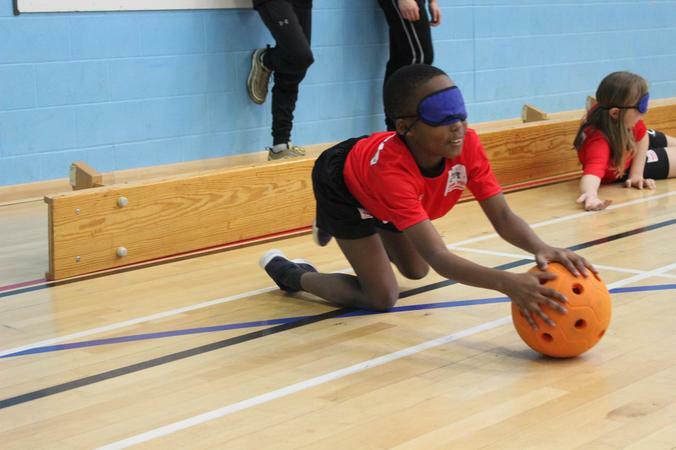 As part of the Dartford School Games Partnership, North Kent College students hosted the Dsitrict’s first Goalball tournament. 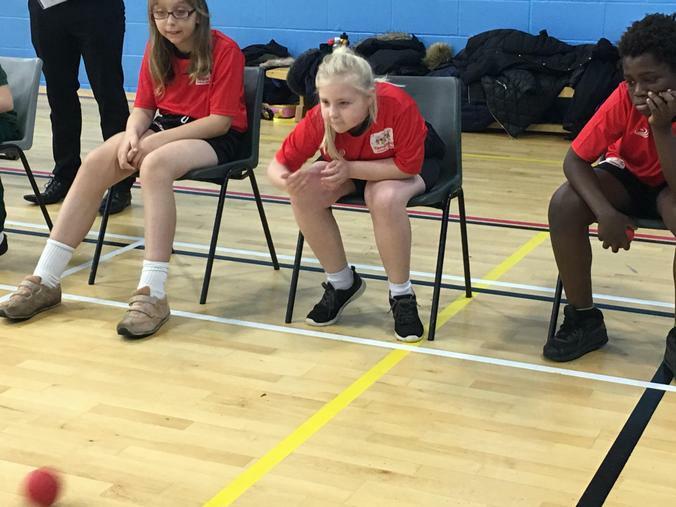 We were lucky enough to be able to enter two teams, so seven children from Year 4-6 travelled to NKC on Wednesday 16th January, to take part in this exciting opportunity. 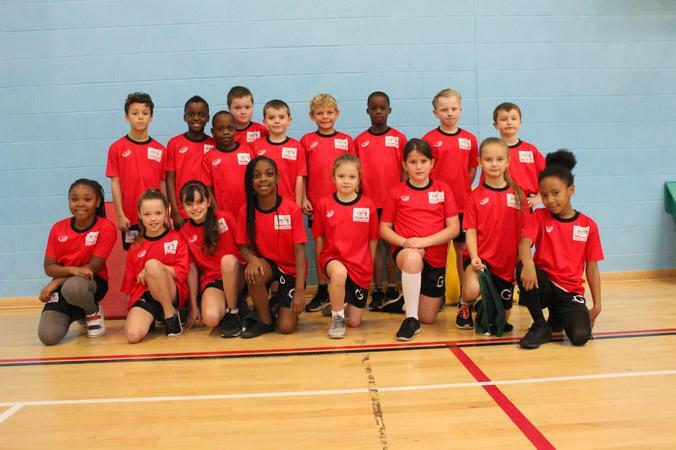 Nine teams took part, with us playing each other once. 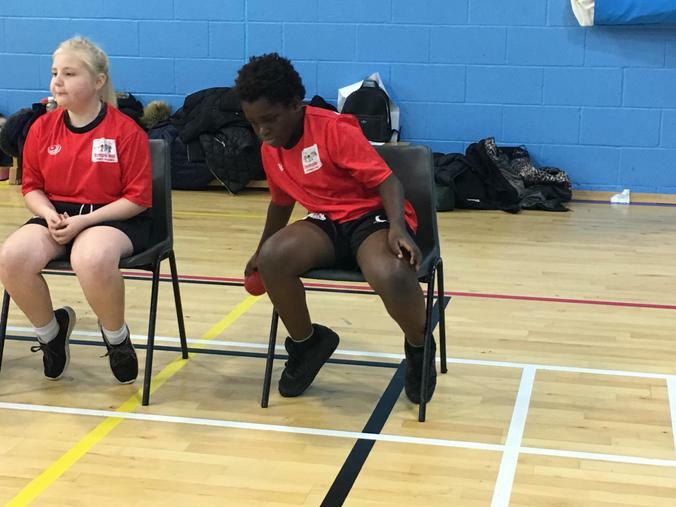 You scored 3 points if the ball hit your opponents bench (the goal), 1 point if you successfully defended your goal, with the team scoring the most winning the game. 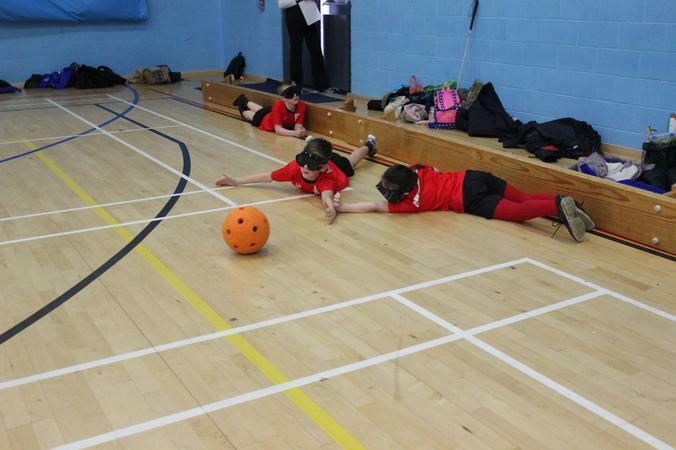 Both our teams played exceptionally well, considering we had one hour of training the week before. 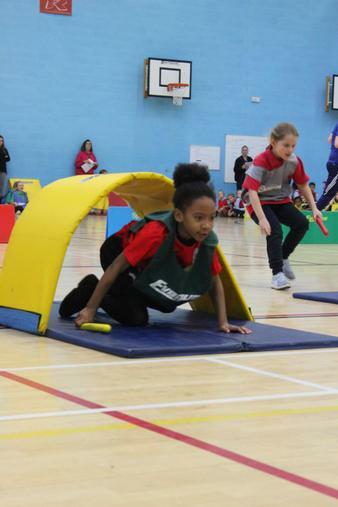 We consistently demonstrated the School Games Values; Teamwork, Passion, Honesty, Respect, Determination, Self-belief and above all fairplay! 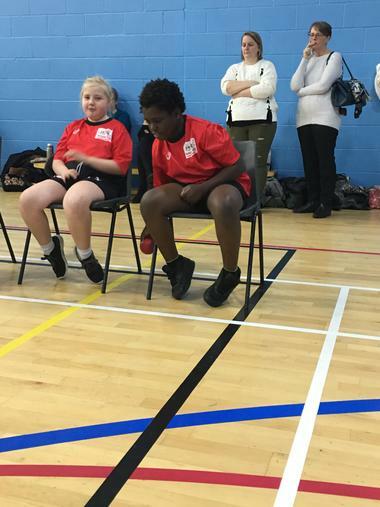 Everyone thoroughly enjoyed themselves. 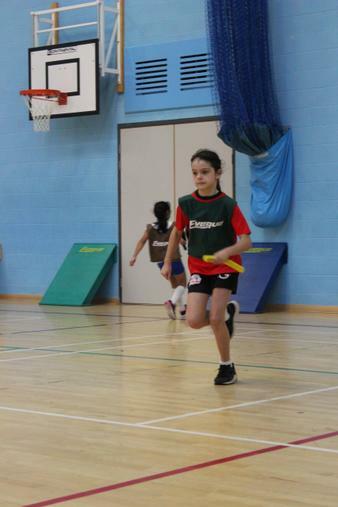 We finished 5th and 7th overall. 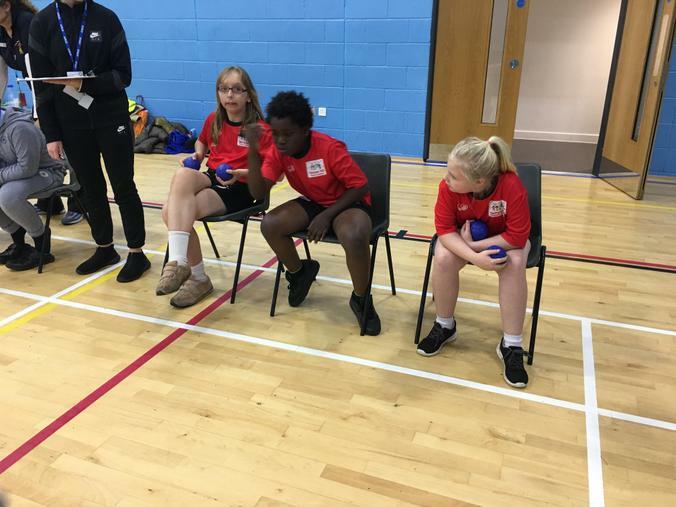 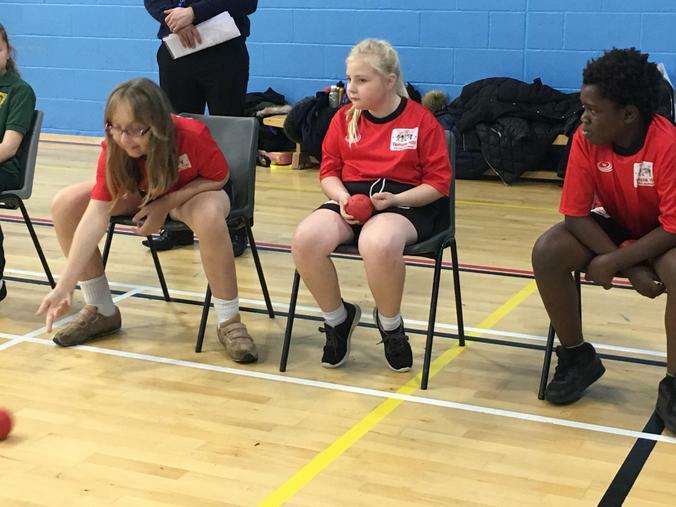 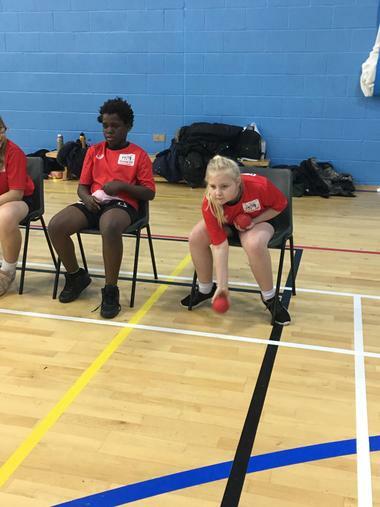 Three very excited Year 5 and 6 children travelled to Farifield Leisure Centre today for the first of three Boccia Festivals. 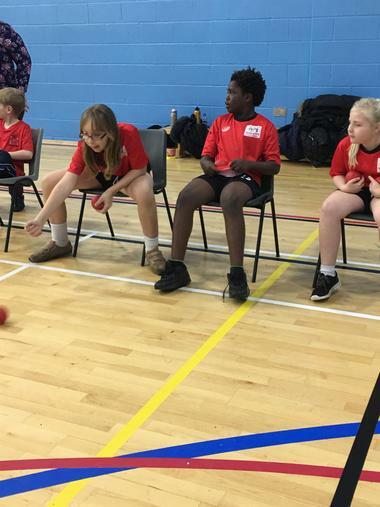 Boccia is contested between teams of three. 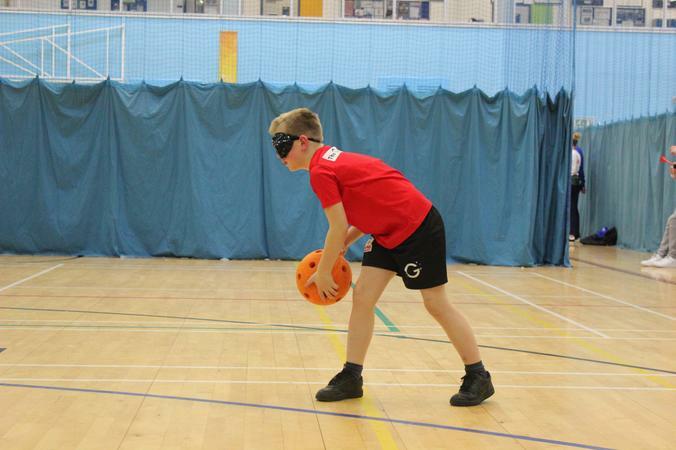 The aim of the game is to get one of your balls closer to the jack than any of your opponent’s balls. 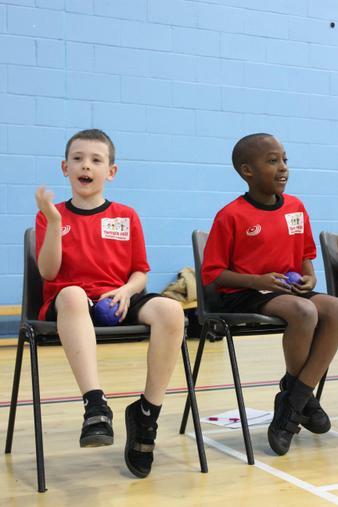 A game is divided into ‘ends’, the overall winner of the match is the team to win a predetermined number of ends. 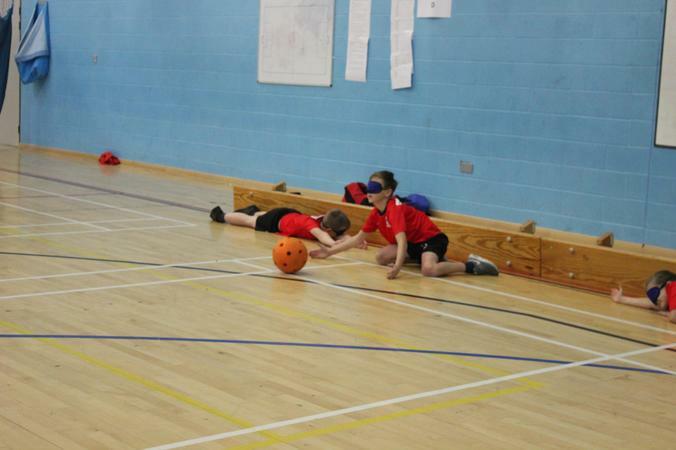 Each team gets six balls to play to see who can get closest to the jack, the winner takes that game. 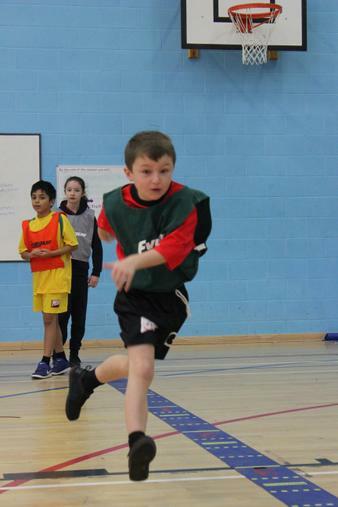 We got off to a flying start winning our first two games and the match 2-1. 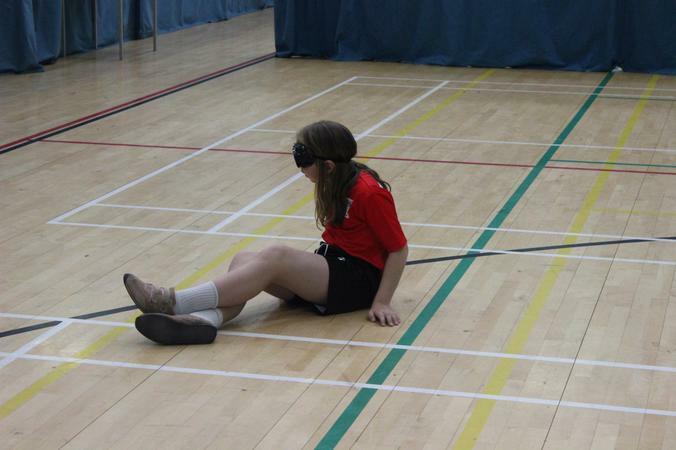 We went on to lose our next two matches 2-1, but pulled back a further three wins to finish joint 4th overall. 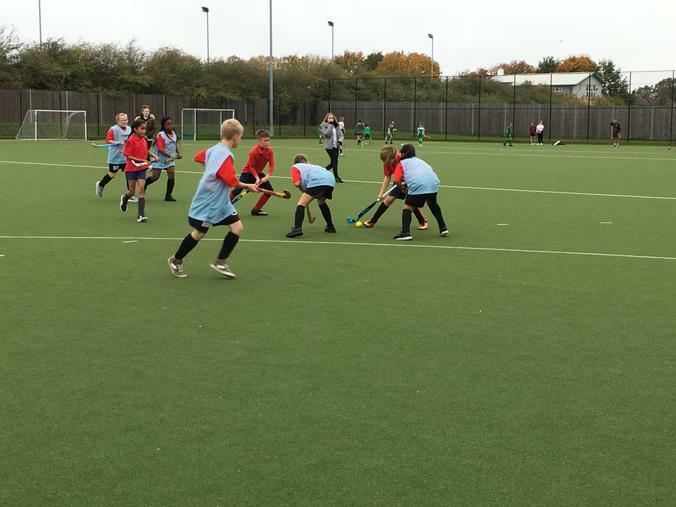 The team played brilliantly and thoroughly enjoyed the afternoon. 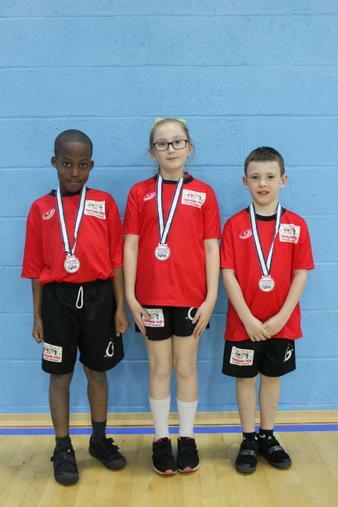 Well done to all three of you! 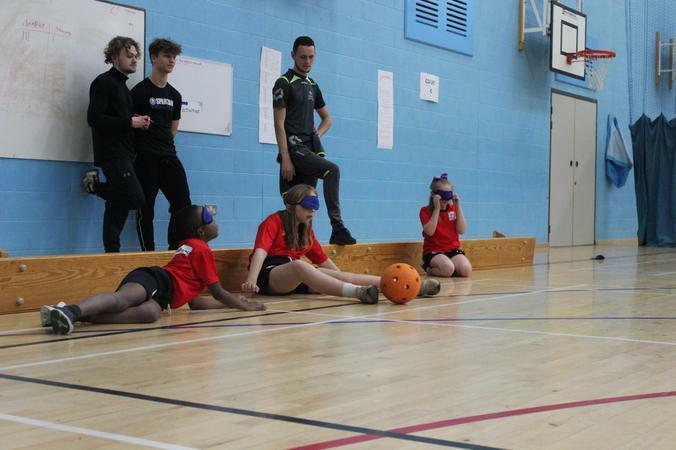 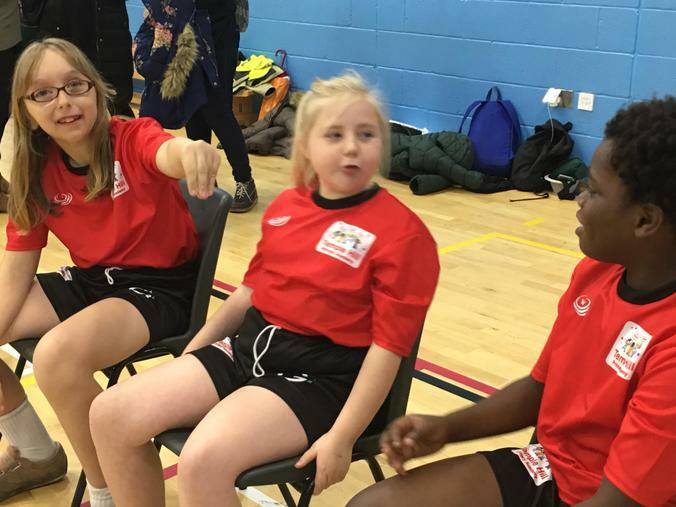 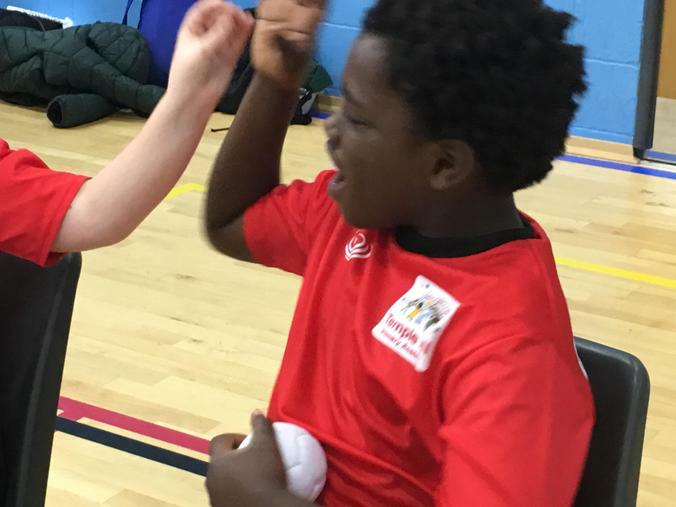 On Tuesday 12th and Wednesday 13th November, North Kent College hosted two days of Sportshall Ahtletics as part of the School Games events. 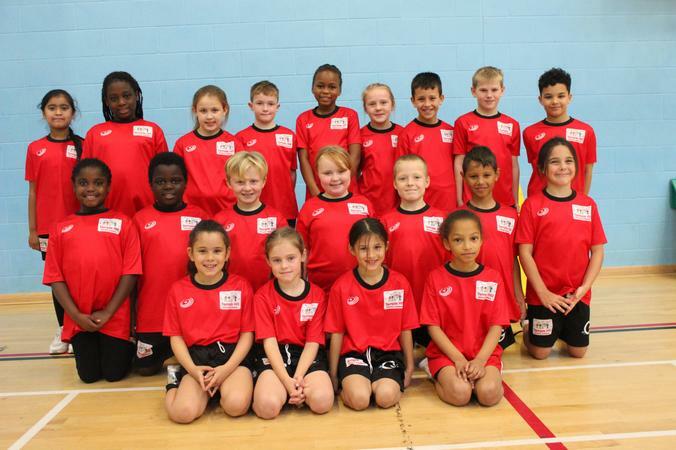 We entered three teams over the two days which amounted to over 50 children taking part. 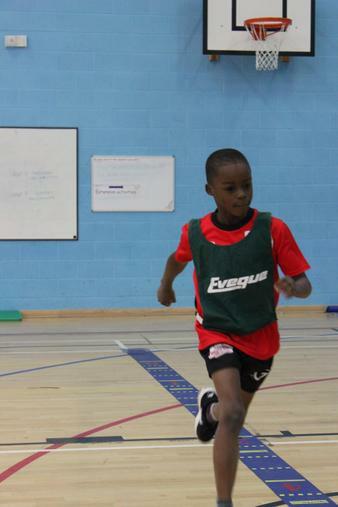 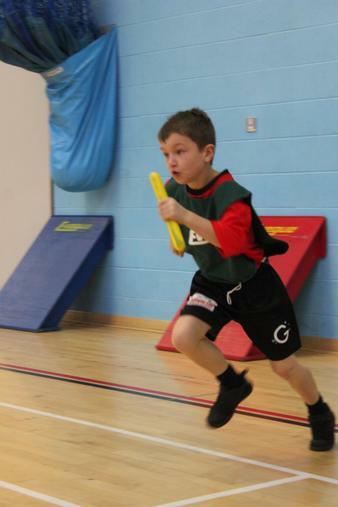 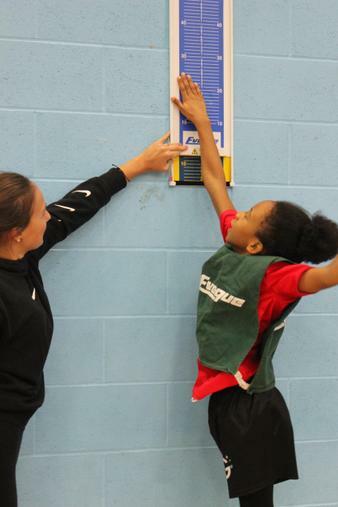 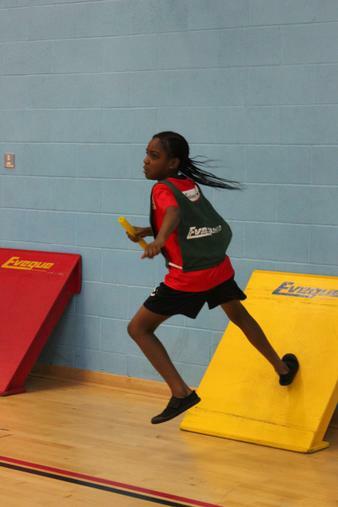 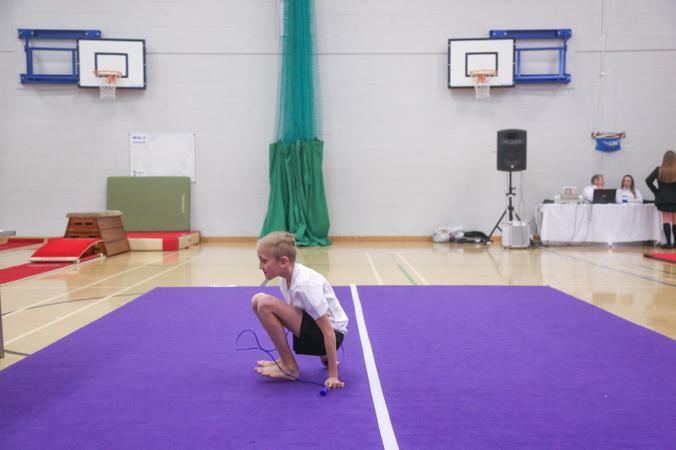 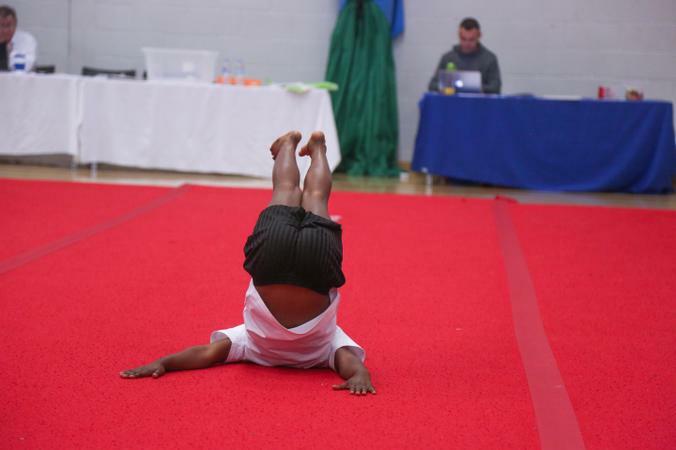 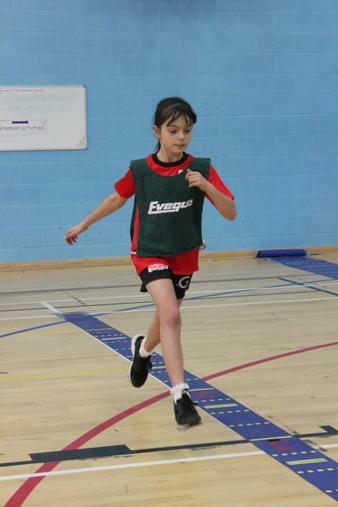 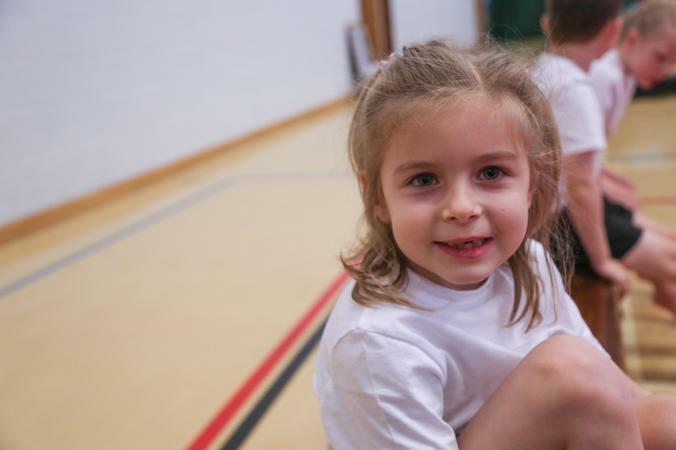 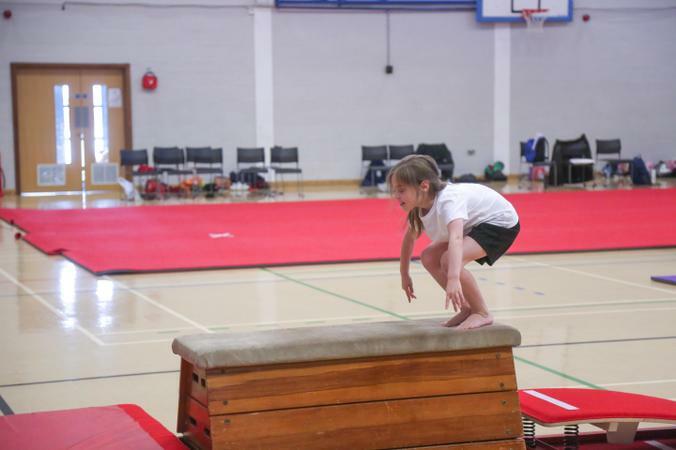 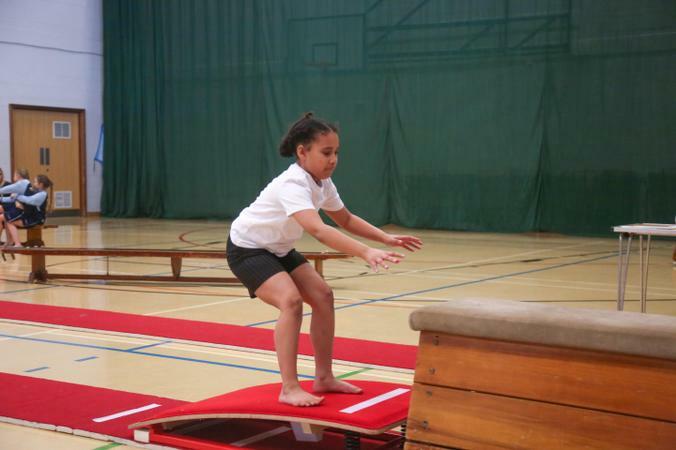 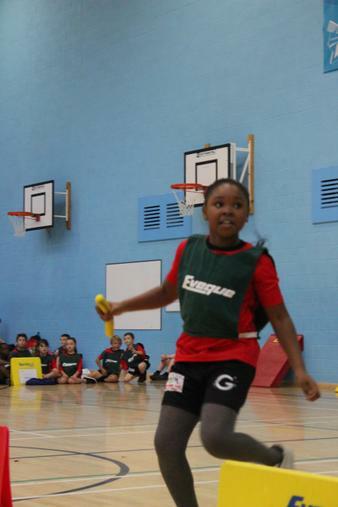 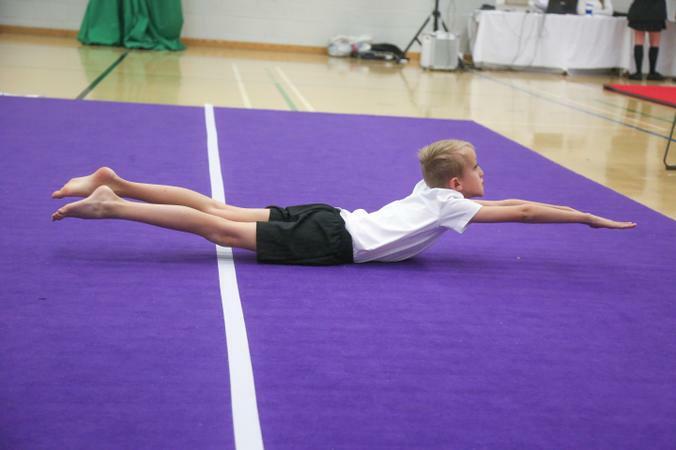 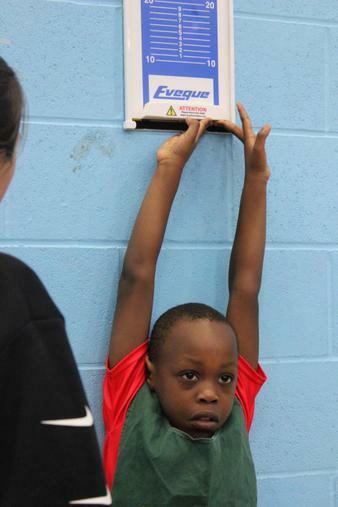 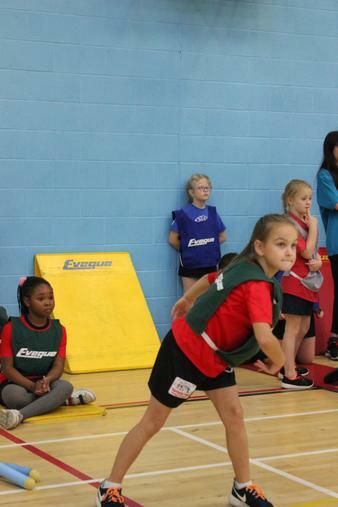 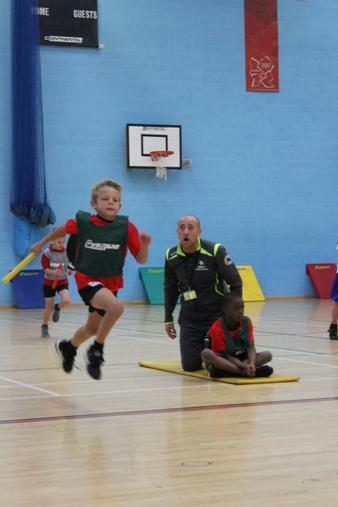 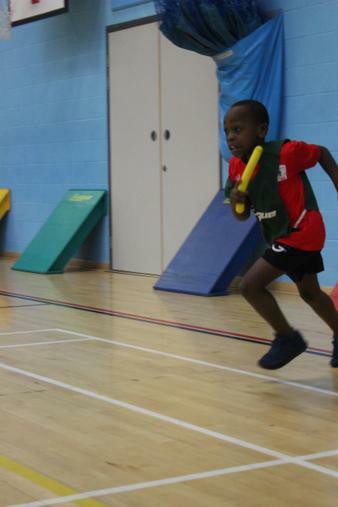 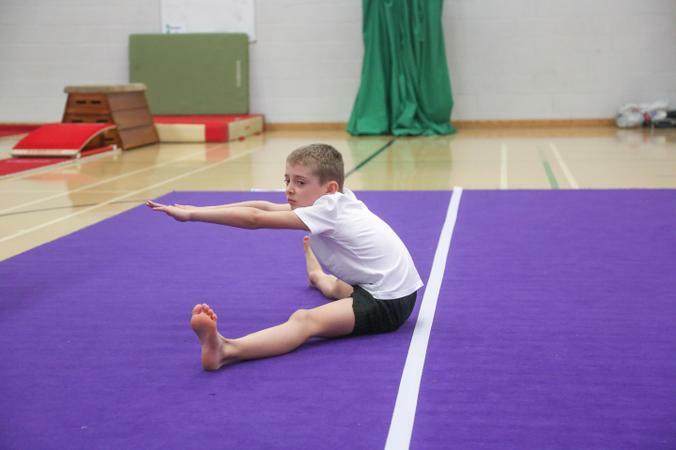 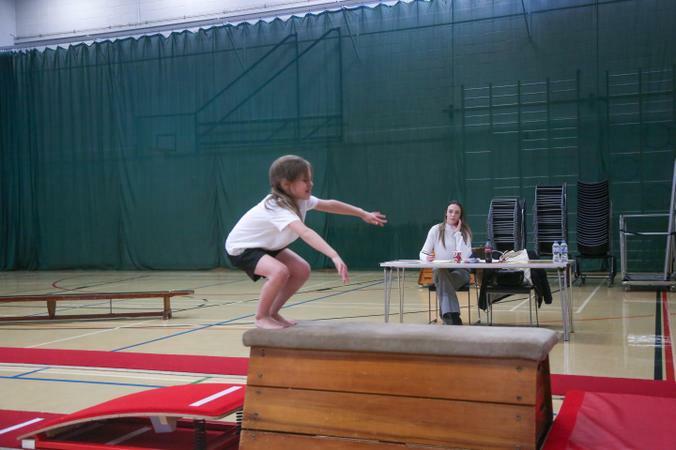 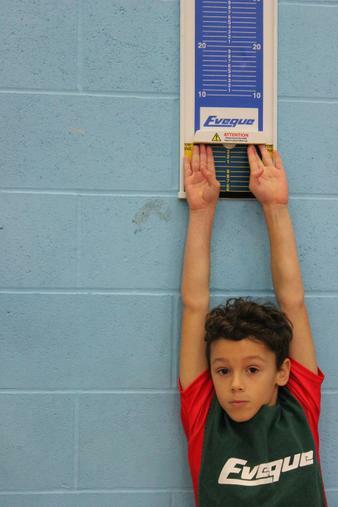 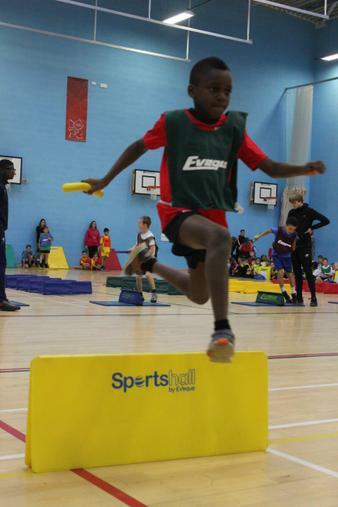 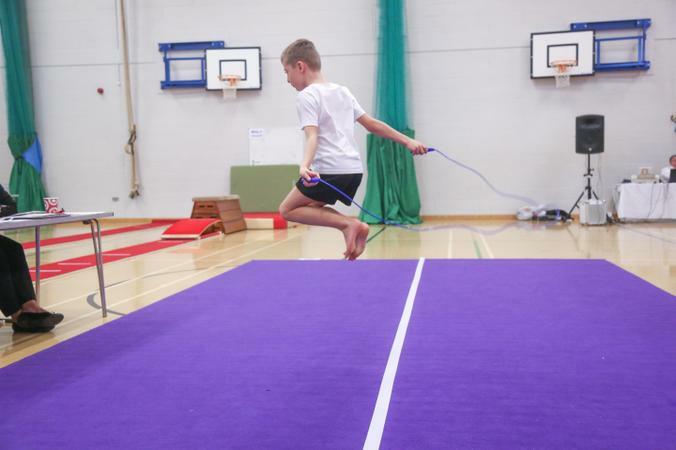 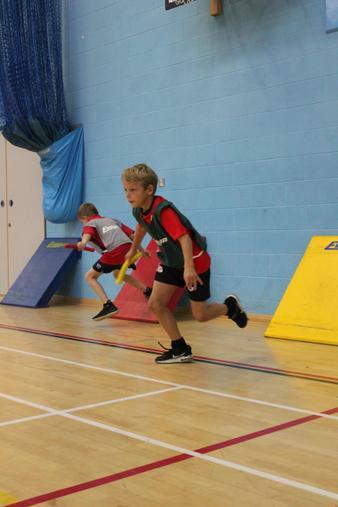 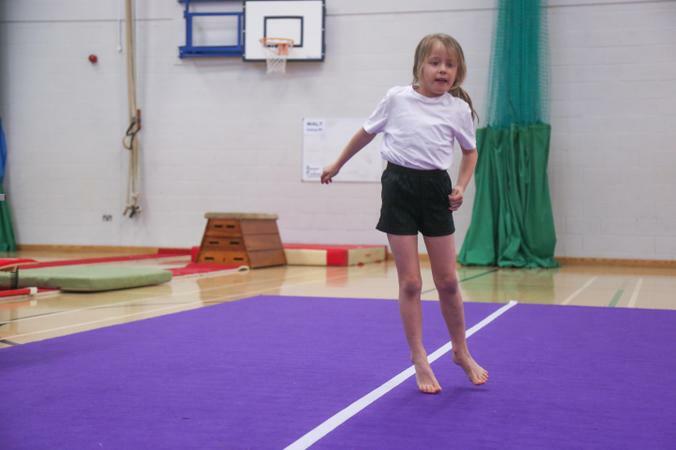 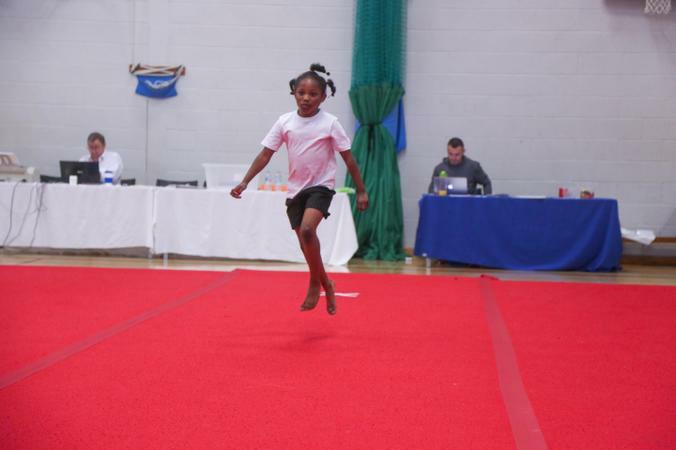 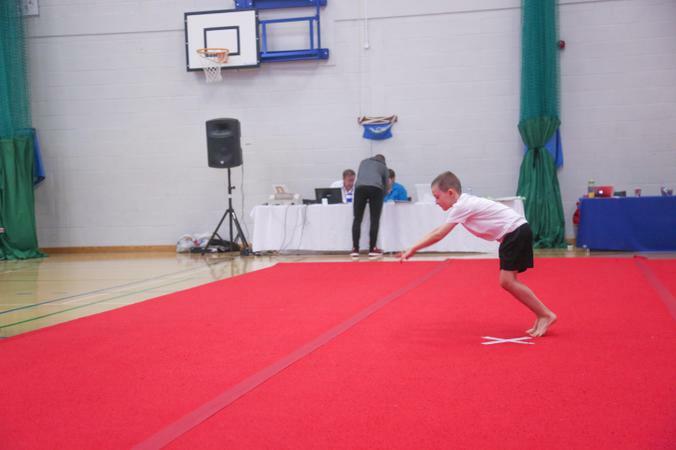 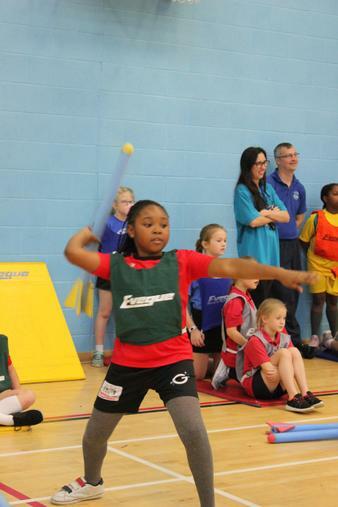 Sportshall is made up of six field and six track events, with every child taking part in at least two events each. 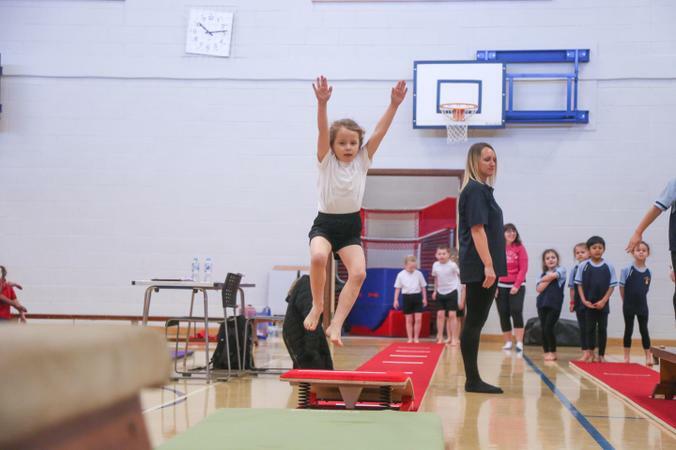 This is a fantastic event with 14 schools taking part from across the district at each event on Tuesday and 10 schools on Wednesday. 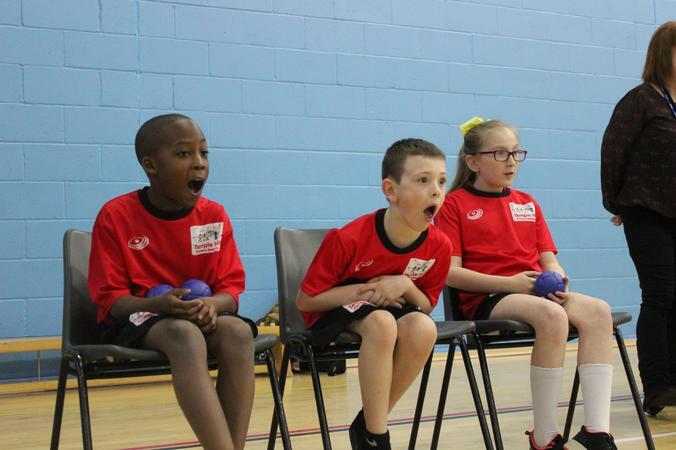 The children get to make as much noise as they can cheering on their team mates and boy, did they! 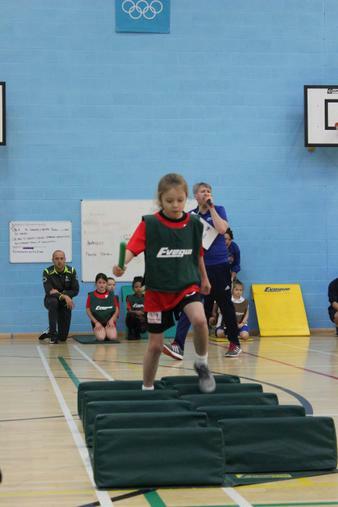 We did amazingly well with one Year 3/4 team coming 4th, Year 5/6 in 5th place and Year 3/4 on day two in 6th place. 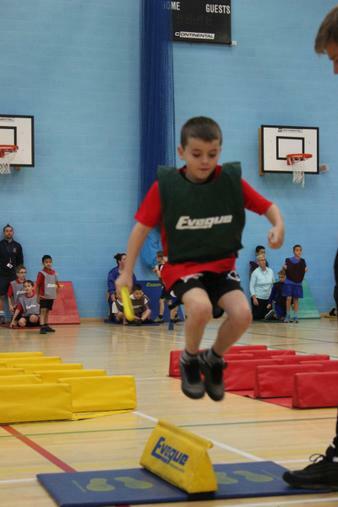 There were plenty of top three finishes as well! 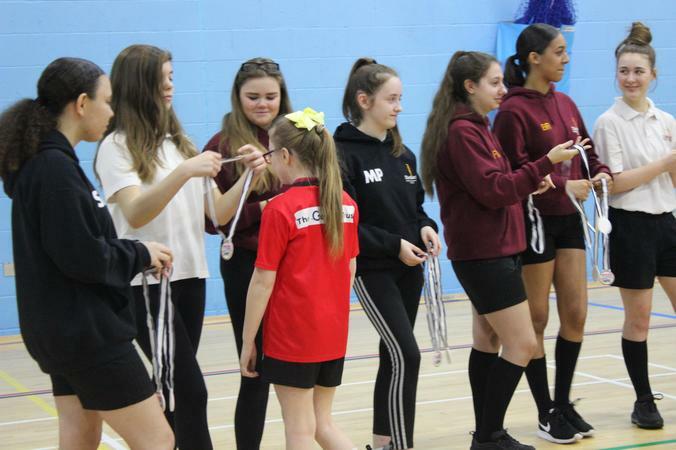 Congratulations and well done to everyone who took part. 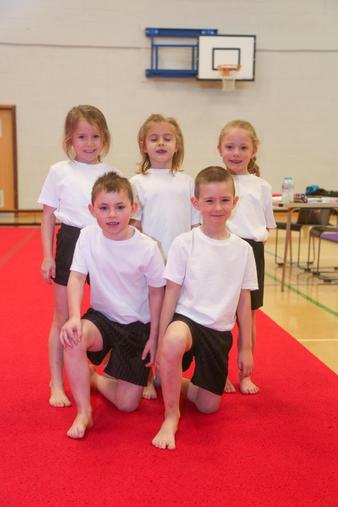 We are all very proud of you! 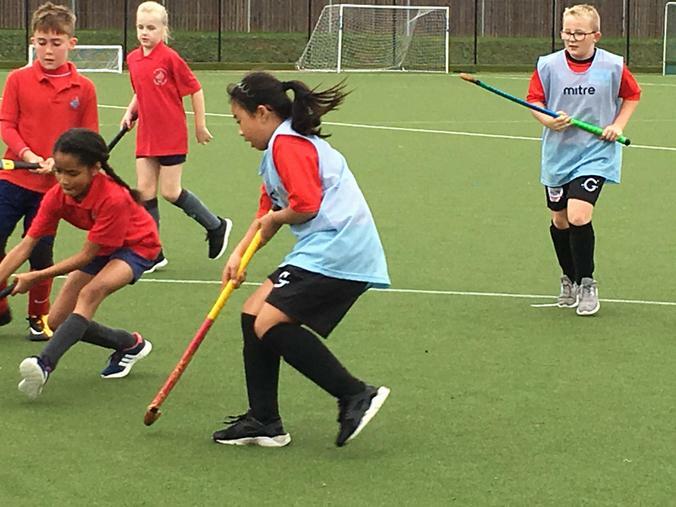 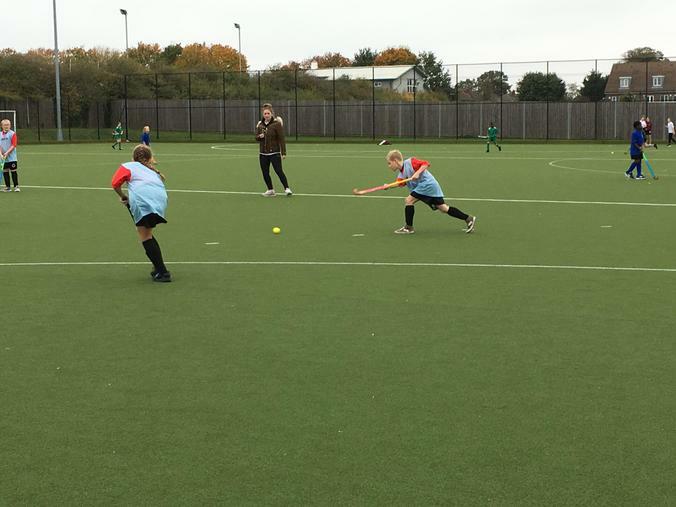 On Wednesday 17th October it was our Y5/6 teams turn to travel to DSTC for the School Games Quicksticks Hockey Tournament. 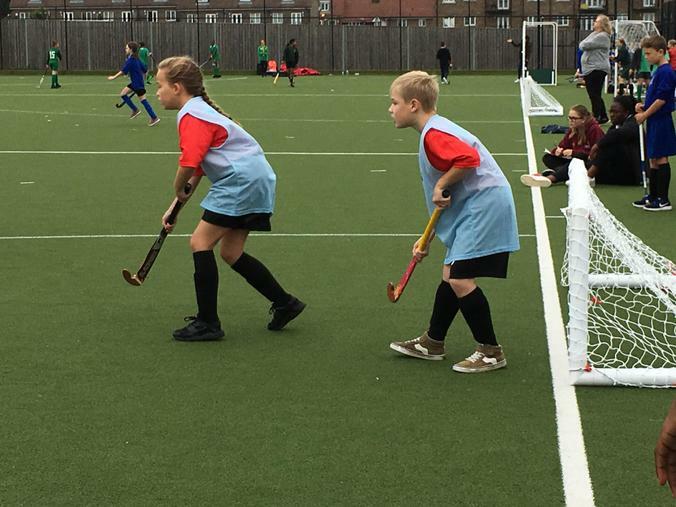 We played some great hockey with fantastic set pieces ending with a mix of results. 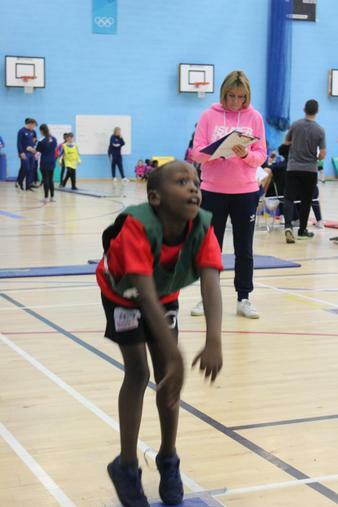 Well done to: Mason, Ben, Charlie, Odafe, Tyra, Kylie Mia and Pedetin and thank you to Miss Blackmore for coaching the team on the day. 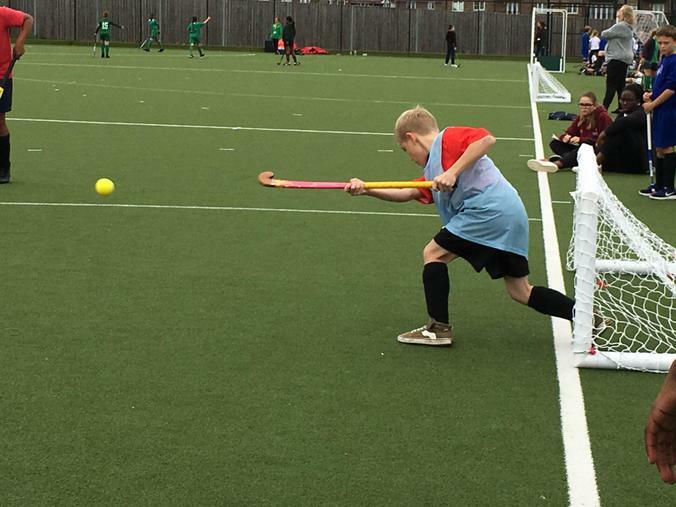 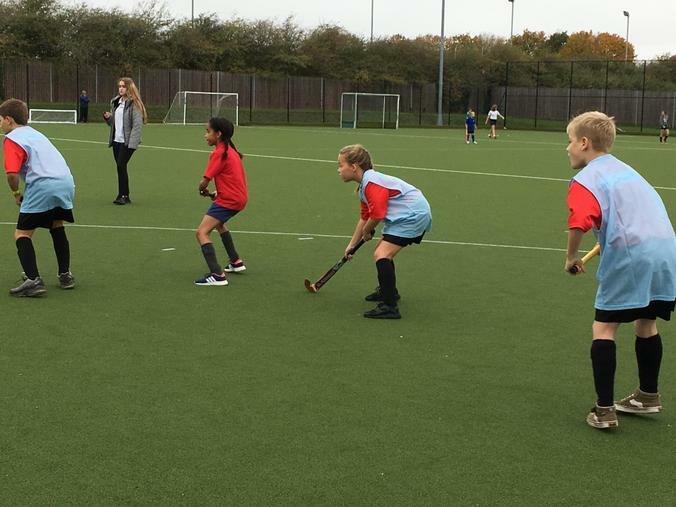 Our school games tournaments got underway on Wednesday 10th October starting with Y3/4 Quickstick Hockey. 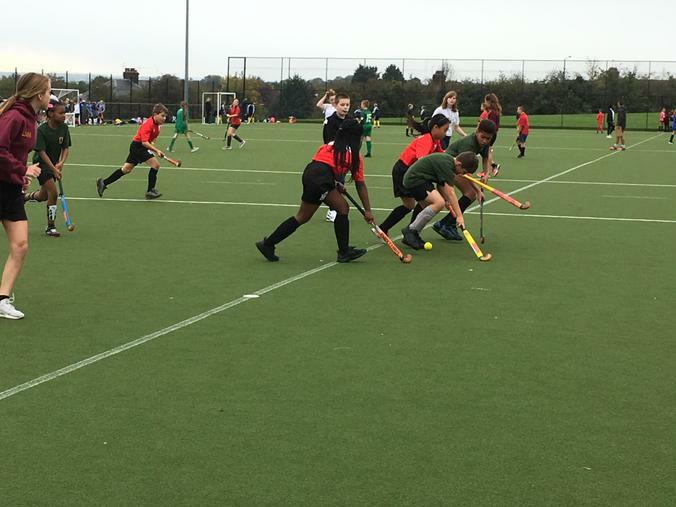 Our team played well with determination, fair play and great teamwork. 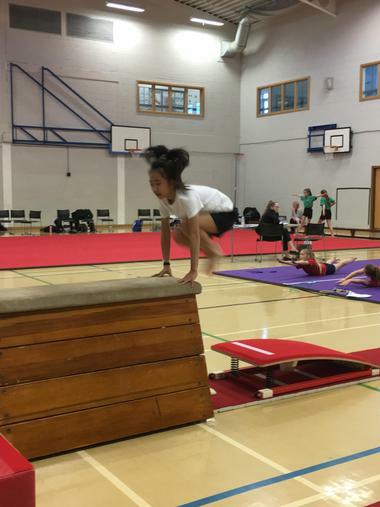 Well done to Henry, Joey, Safwan, Christelle, Emilija and Isobel.